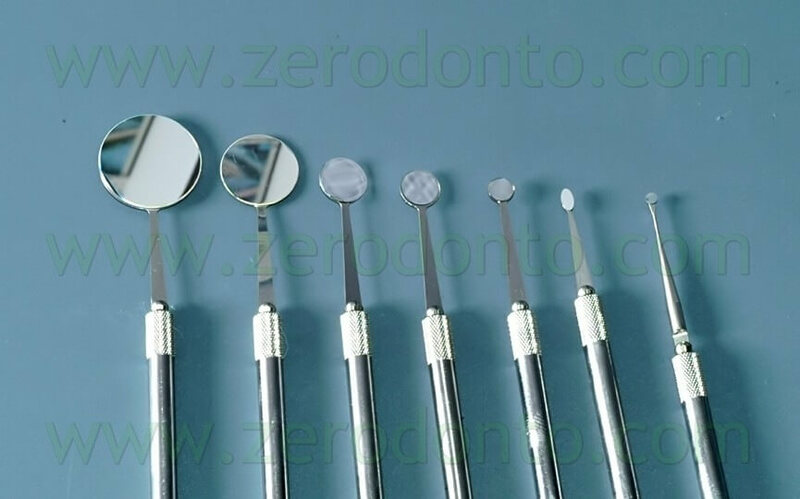 By Surgical Endodontics one refers to that branch of Dentistry that is concerned with the diagnosis and treatment of lesions of endodontic origin that do not respond to conventional endodontic therapy or that cannot be treated by conventional Endodontic therapy. 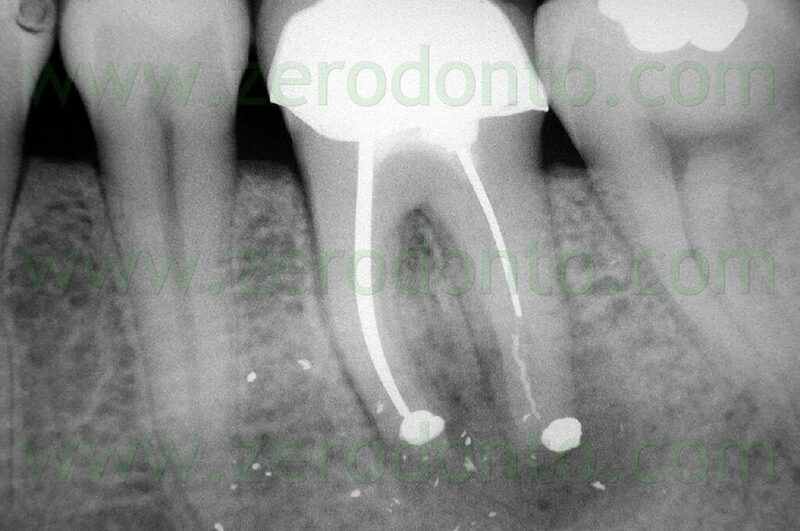 The scope of Surgical Endodontics is to achieve the three dimensional cleaning, shaping and obturation of the apical portion of the root canal system which is not treatable via an access cavity, but only accessable via a surgical flap (Fig. 1 a,b,c,d). For this reason it is preferable to use the term Surgical Endodontics rather than Endodontic Surgery, in as much as the procedure should be planned and carried out as an endodontic procedure via surgical access and not a surgical procedure done for endodontic reasons. 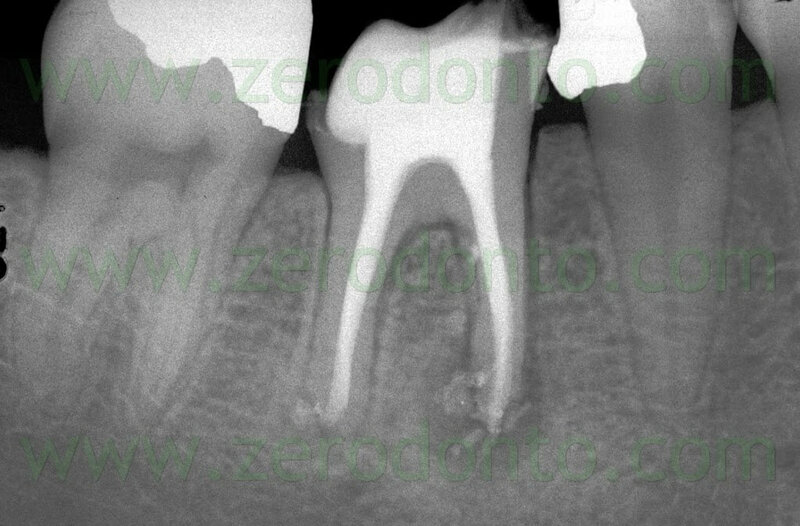 Once a diagnosis of Endodontic failure has been made, it is necessary to understand what the cause of the failure was so that successively the possibility of correcting the failure by orthograde retreatment can be evaluated. Only in the case where this possibilità does not exist or better still after failure of the non-surgical therapy carried out to resolve the problem, only then is one authorized to intervene surgically. 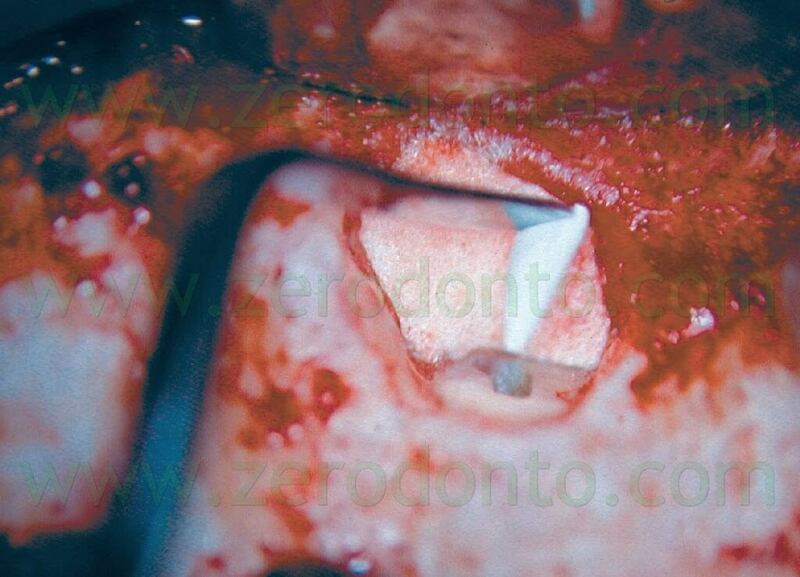 Apical Surgery in other words is not a substitute for incomplete debridement and poor endodontics (Fig. 2 a,b,c,d). In agreement with what Nygaard-Ostby and Schilder 8 confirmed, Surgical Endodontics must be reserved for those cases in which the preparation and obturation of the root canal appear impossible right from the beginning or when the non-surgical retreatment attempts have failed. Nevertheless, even in such cases, the authors recommend filling as much of the root canal by conventional method as possible. 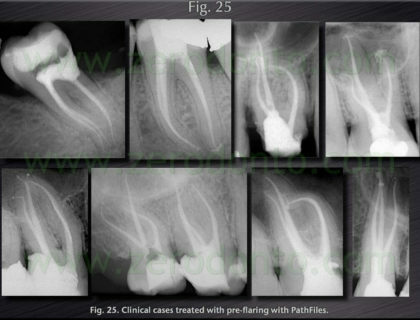 Currently the technique and instruments for clinical retreatment of endodontic failures are so refined that the cases that for certain have to be treated surgically because they cannot be retreated by orthograde means are becoming fewer. 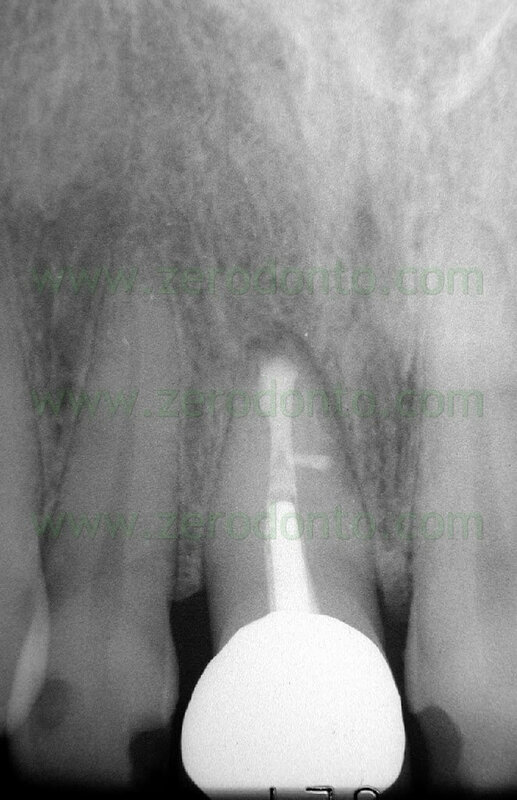 Often a high level of Surgical Endodontics experience masks the operators inability to carry out a correct cleaning, shaping and three dimentional obturation of the root canal system by non-surgical means. 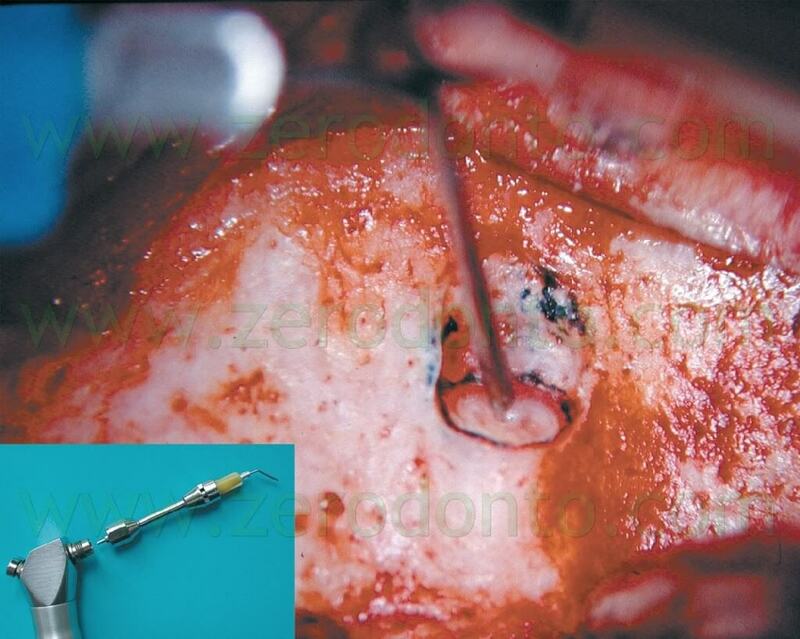 Ultimately even after the indication for surgery has been established, in agreement with Weine and Gerstein,17 it is recommended to remove as much as possible of the inadequate preceeding canal obturation material and replace it with well compacted gutta-percha: in this way lateral canals, forgotten additional canals can be filled, often removing the need for surgery (Fig 3 a,b,c). 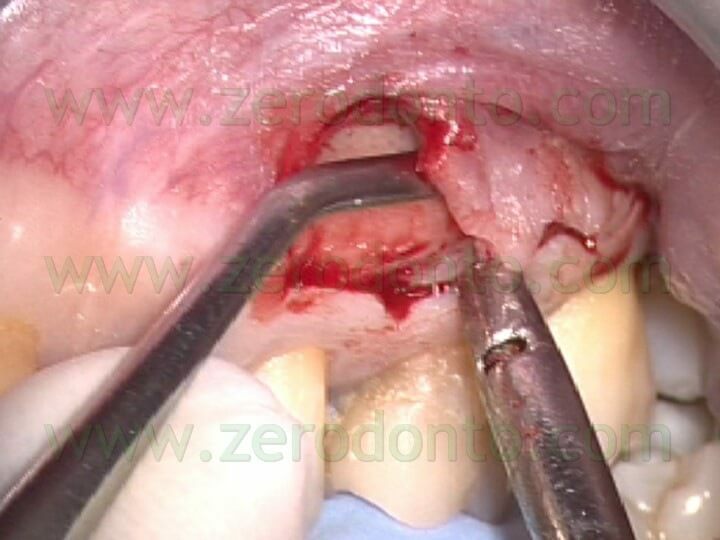 Nevertheless, in those cases which still have the indication for surgery it is currently possible to have a notably increased percentage of success with the treatment of surgical cases compared with what could be attained up untill a few years ago, and this is thanks to recent technological progress that has happened in the field of Surgical Endodontics. 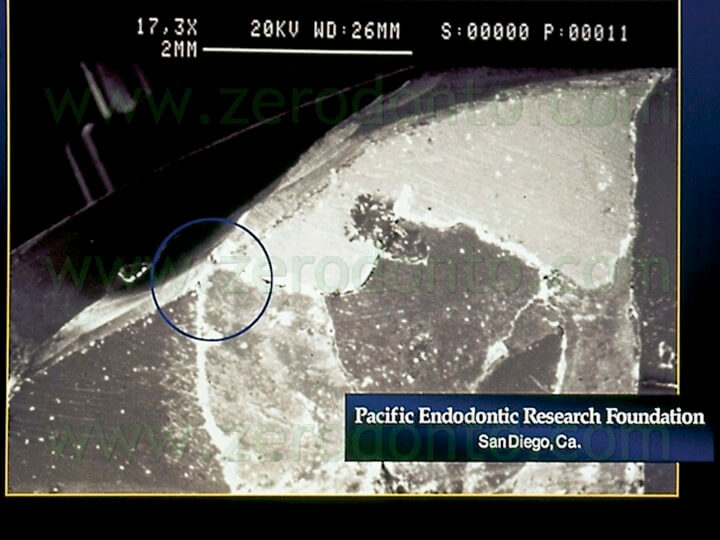 In the last 10-15 years two important developments have been introduced in surgical endodontics: the ultrasonic root end preparation and the surgical operating microscope. 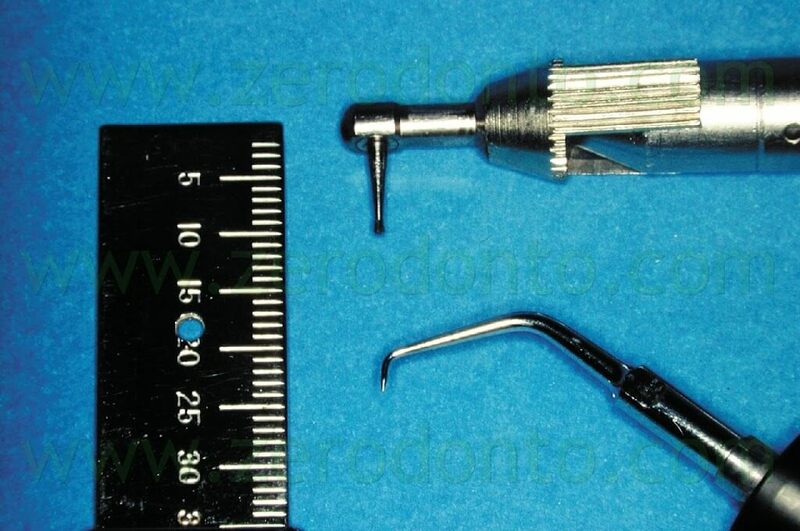 For many years the root end has been surgically prepared drilling a class 1 preparation into the dentin, using a straight slow-speed handpiece or a so called “miniature” contra-angle handpiece (Fig. 4) with small round or inverted-cone carbide burs. 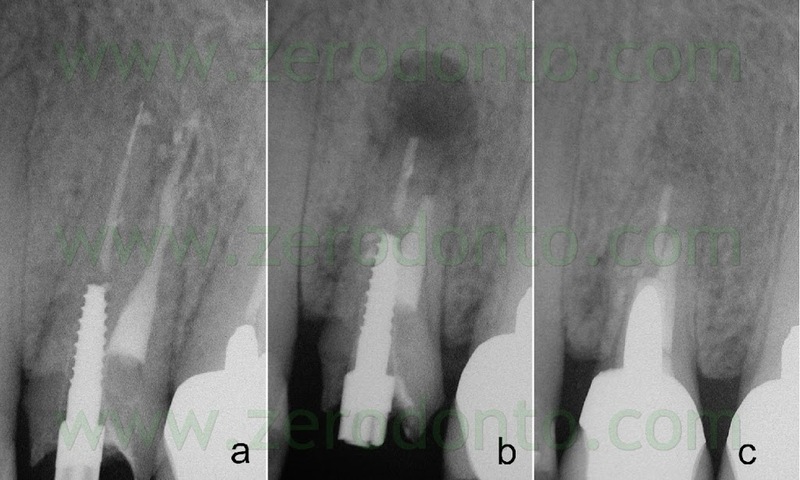 This approach had many disadvantages, mainly the impossibility to create a preparation in the longitudinal axis of the root canal and to clean the buccal surface of the root end (Fig. 5). 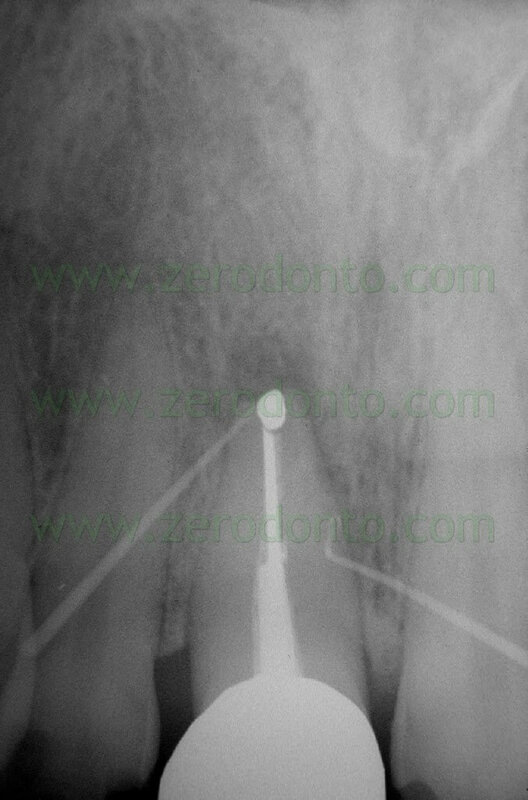 Trying to give enough retention to the cavity, the risk of a palatal or lingual perforation was always present and the procedure was more and more difficult as the root canal was more and more difficult to reach from the operator (Fig. 6 a,b,c). 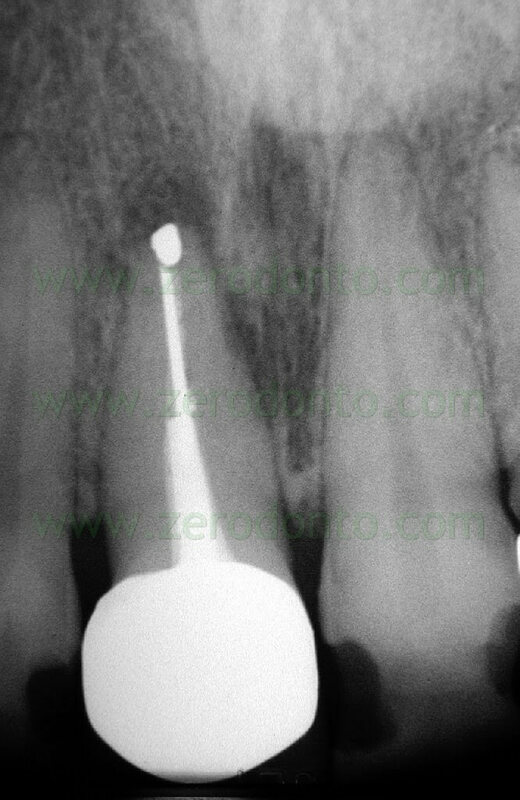 The smallest burs were always too big compared with the diameter of the root canals and the big cavities were therefore more difficult to seal. For the same reason, retro-preparations often failed to include isthmus areas(Fig. 7 a,b,c,d). 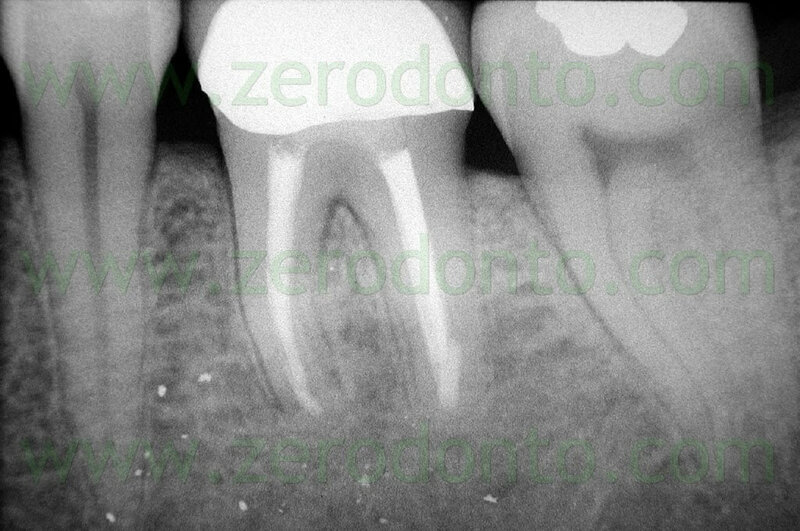 The introduction of the ultrasonic root end preparation made possible to obtain what is defined as the ideal retropreparation: a class 1 preparation at least 3 mm into the root dentin with walls parallel to an coincident with the anatomic outline of the pulpal space.1,3 In order to do this, special ultrasonic tips were developed to enable the clinician to reach every root in all clinical situations. 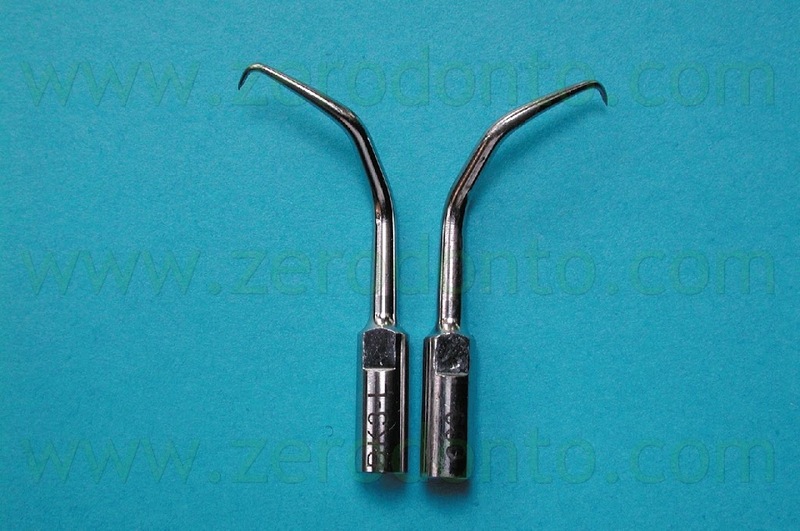 The use of the specifically designed retrotips allows the operator to clean the root canal from an apical approach, leaving clean dentinal walls not only on the lingual or palatal side, but also on the buccal aspect, which was impossible to clean with the previous techniques. The cavity now can be made 3 mm deep, without the necessity of making undercuts, since there is no need of further retention. 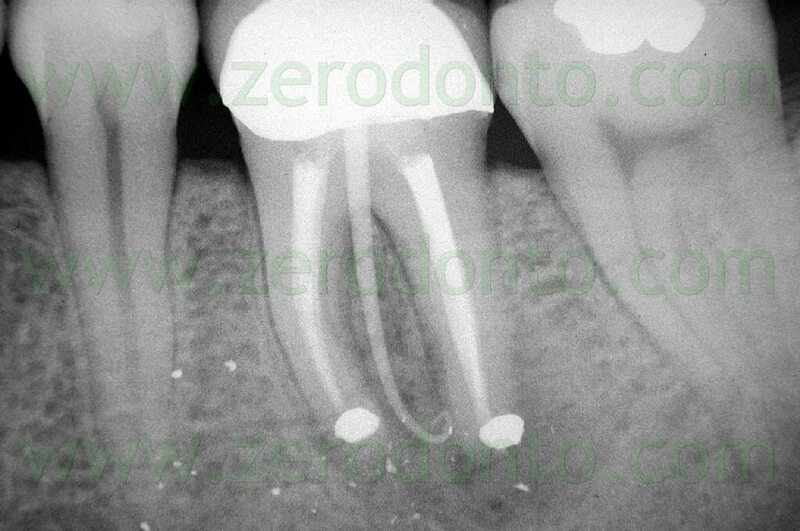 The retrotips are of the same size or even smaller compared to the original size of the root canal, so that the retropreparation can be easily and predictably sealed in the maximum respect of the original anatomy. The isthmus area can now be included into the preparation, without damaging or weakening the root, while being extremely conservative in the mesio-distal dimension. To increase visibility, surgical telescopes or loops and surgical headlamps became available. Loops are available in a variety of configurations and magnifications, starting from 2x up to 6x, with Galileian optics or prismatic optics. When a fiberoptic headlamp is added to the loops, a coaxial light is projected into the surgical field, so that both magnification and illumination are enhanced. On the other hand, how much magnification is enough? Clinicians who have benefited from the use of loops and headlamps soon understand the limitations of this system. 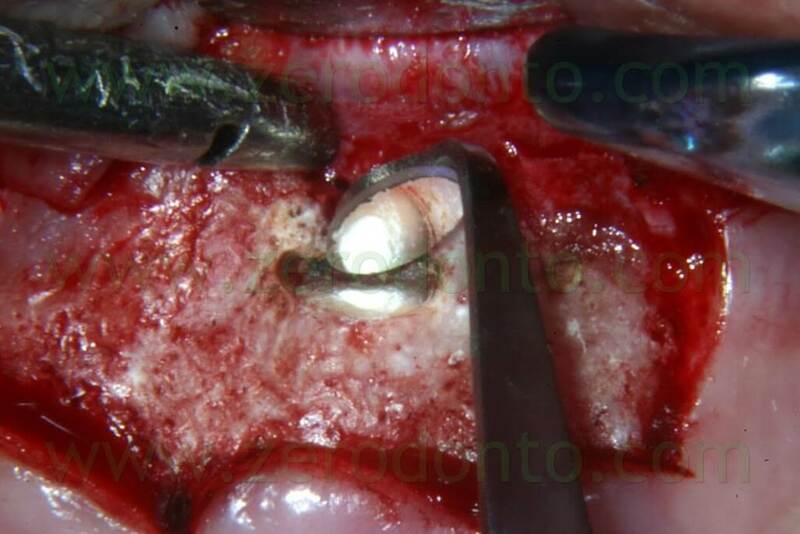 Magnification of 6x sooner or later is not enough anymore and the headlamp is not capable to send the light deep into the canal in surgical and nonsurgical endodontics. The right answer to the previous question is: “enough to see and solve the problem”. The surgical operating microscope has a range of magnifications from 2.5x to 25x and the illumination is coaxial with the line of sight. The coaxial illumination has two advantages: a) the clinician can look into the surgical field without any shadows (which means that it is possible to examine the cleanliness of the retropreparation during surgical endodontics); b) since the coaxial illumination is made possible because the operating microscope uses Galileian optics, and since Galileian optics focus at infinity and send parallel beams of light to each eye, the operator’s eyes are also focusing at infinity and every procedure can be performed without any eye fatigue. d) better predictability of long term results. 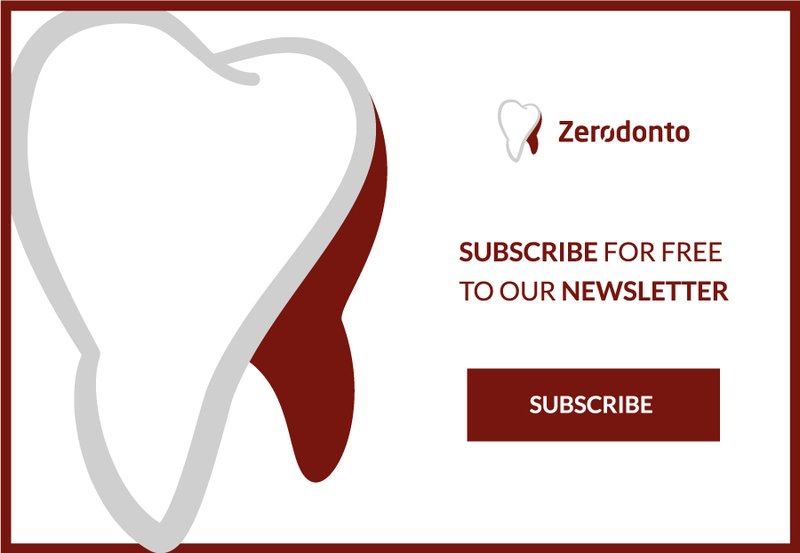 For these reasons, the author is firmly convinced that surgical endodontics should not be performed without the use of the microscope, from the injection of anesthesia to the removal of sutures. 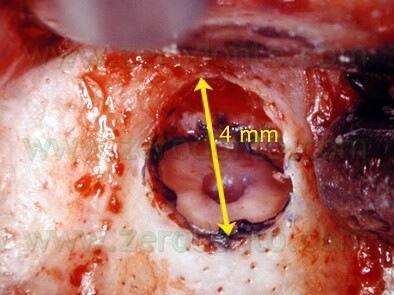 Under the microscope, the incision made with the microsurgical scalpel is more accurate, with less trauma to the soft tissue, a more passive flap elevation and later reapproximation is semplified. 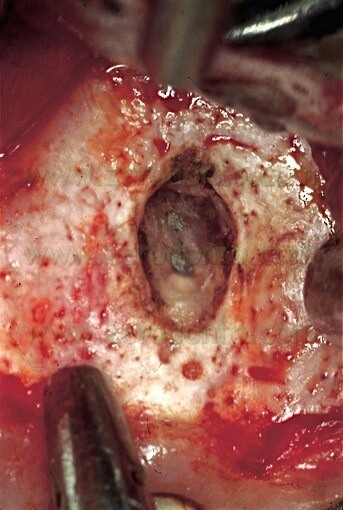 At minimum magnification, the entire surgical field can be observed (Fig. 9), looking for the mental nerve (Fig. 10), for instance. 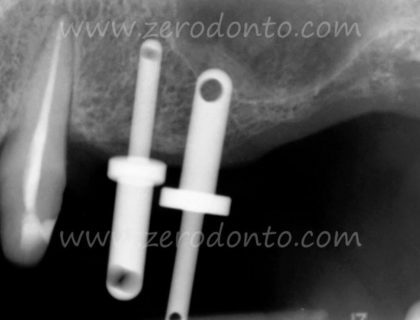 The size of the osteotomy is usually small (usually less than 5 mm), big enough to accomodate the ultrasonic tips, which have a tip length of 3 mm (Fig. 11). Working at 10x to 20x magnifications, the small osteotomy allows a perfect control of the entire surgical procedure. 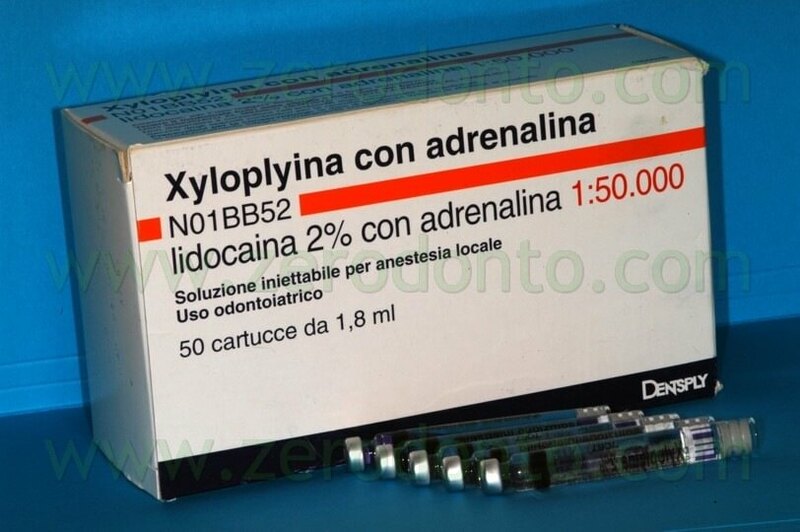 For this purpose, the anesthesia of choise is 2 lidocaine with 1:50.000 epinephrine. 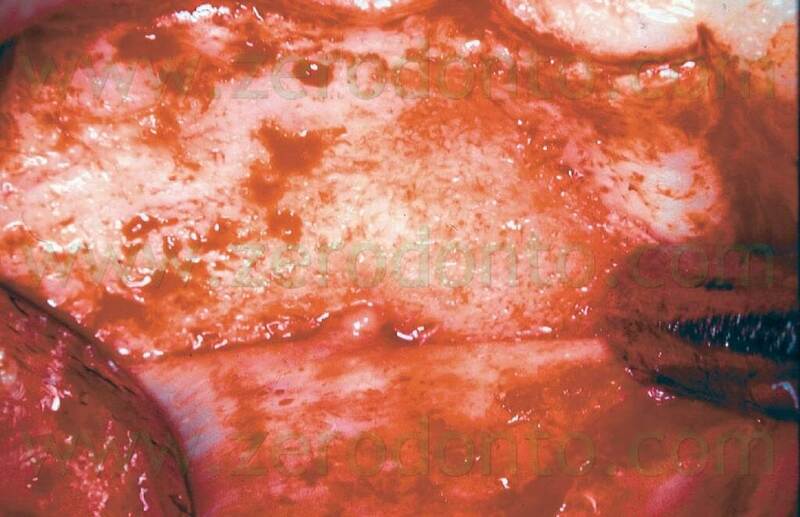 Other anesthetic solutions with less epinephrine are contraindicated, because the eccessive bleeding of the surgical site will compromise surgical visibility. The slow administration of anesthetic solution with 1:50.000 epinephrine has no contraindication even in medically compromised patients. The use of the microscope during the administration of the anesthetic solution is helpful to avoid the injection near bigger capillary vessels and can guarantee almost no bleeding once the needle is removed. 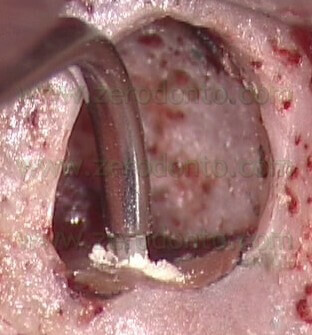 Using microsurgical scalpel blades (Fig. 8) under the microscope even at minimum magnification, the surgeon can make a very precise incision with minimum damage to the soft tissue. If enough attached gengiva is present, the mucogengival incision is preferable, in order to preserve the existing epithelial attachment. 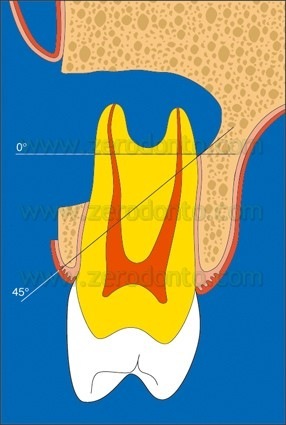 If there is limited attached gengiva or if there are short roots or large periapical lesions or when the cervical aspect of the root must be examined because for instance a vertical root fracture is suspected, the flap of choice is the triangular or rectangular flap with sulcular incision. In both flaps, the elevation must be undermined, (Fig.14 a,b,c), to reduce the trauma to the soft tissue: the elevation begins at the vertical releasing incision and continues to the coronal margins in an apical-coronal direction. The mucogengival incision is scalloped, to facilitate reapproximation, but it is not beveled, like it used to be years ago. As a matter of fact, the incision once was suggested to be beveled to avoid scars. Recent researchers 1 and the use of the operating microscope have demonstrated that the incision made at 90° to the bone below (Fig. 15) allows a much more precise repositioning and suturing of the flap and consequently a better healing by primary intention, with absolutely no scar tissue formation. On the other hand, the beveled incision could cause the surgical flap to slip, with consequent wrong repositioning and healing by secondary intention, which is the only true cause of scar tissue. 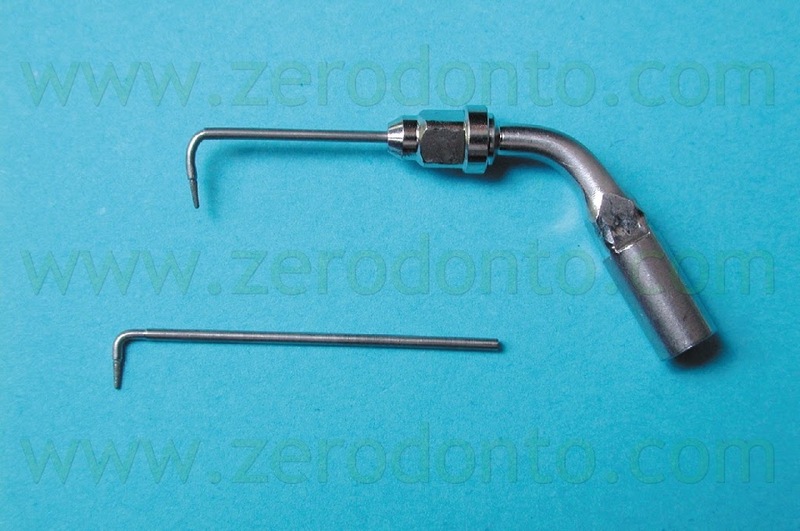 With a round surgical bur mounted on a high speed handpiece (Fig. 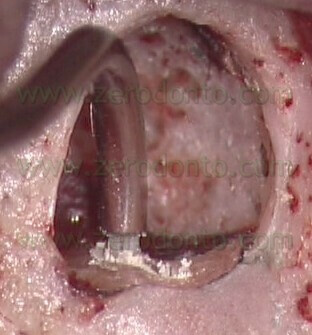 16) and under copious irrigation with saline solution the surgeon starts the removal of bone to isolate the root apex. on a high speed handpiece specifically designed for oral surgery (Fig. 18). 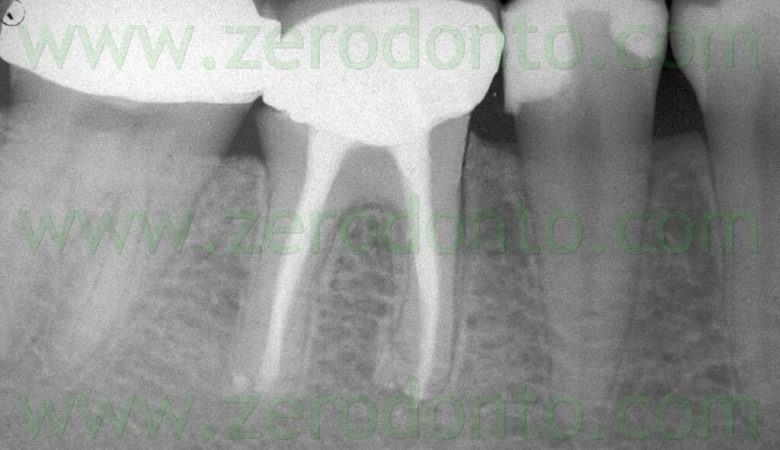 The microscope is very helpful in locating the root canal, to evaluate the presence of multiple portals of exit, to locate and then eliminate the extruded filling material and the old and failing amalgam retrograde, the apical root fracture, and the accessory canals on the root surface. The best way to inspect the surface of the beveled root is using a small amount of methylene blue dye (Fig. 20). It will be a lot easier to verify that the root has been completely sectioned, that an isthmus is present, and if a vertical root fracture is present (Figs. 21, 22). It is imperative that the retrofilling procedure is made in a dry field. For this purpose, the bleeding inside the bony crypt must be totally eliminated and totally under control. The dental assistant uses a small suction tip and follows the entire procedure using the assistant scope. She will help to maintain a dry field and a good visibility for the surgeon. If the suction is not enough to keep the blood away from the beveled root surface, a few drops of anesthetic solution with 1:50.000 epinephrine are placed on a sterile gauze and then pushed against the walls of the bony crypt for a few minutes. Another more efficient method to completely eliminate the bleeding from inside the crypt is the use of ferric sulfate, which causes instantly a very good haemostasis, having an extremely low pH (0.21) and causing rapid intravascular coagulation (Fig. 23 a,b). The use of ferric sulfate has no contraindications, but it must not be used in contact with important anatomic structures, like mandibular or mental nerve, maxillary sinus or floor of the nose. Its use is also to be avoided on the cortical bone and on soft tissues. 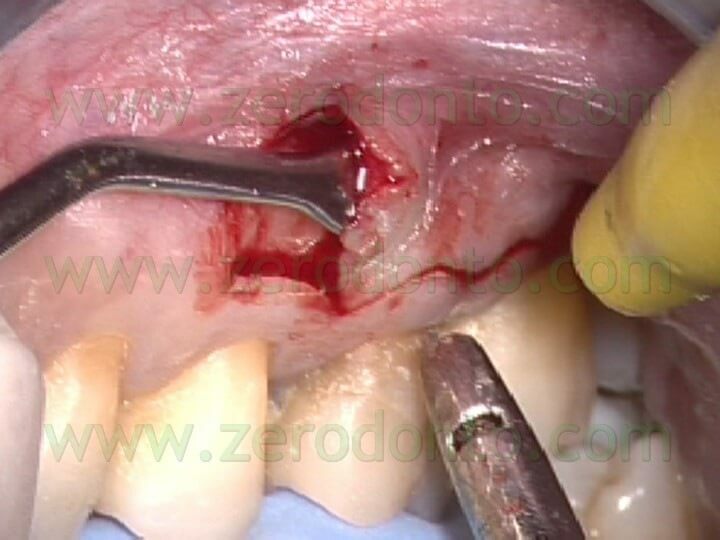 When the retrofilling procedure is completed and before suturing, it is also imperative to completely remove it in order to avoid a delay in the healing process,6,7 and for this purpose a curette under copious irrigation is used in order to stimulate the bleeding. A special tip to work in roots with a very pronounced lingual inclination is the Back Action Tip, designed by Gary Carr (Fig. 26). 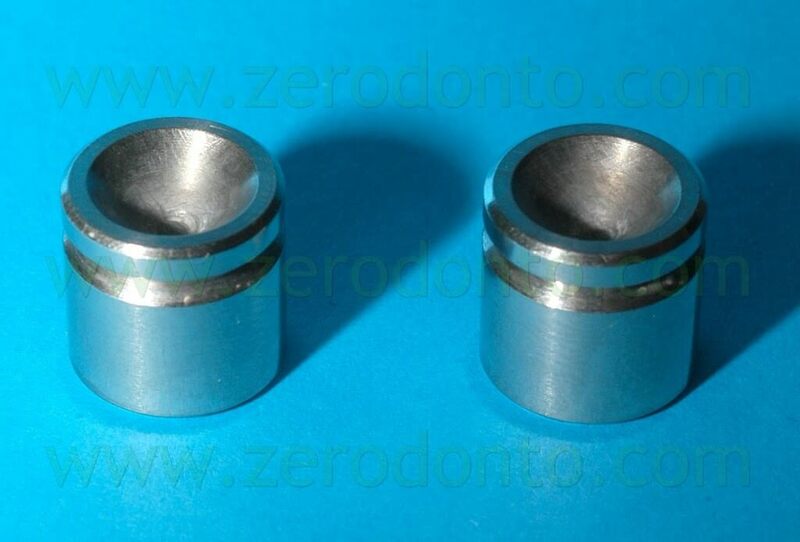 Recently, Syngcuk Kim designed new tips made in stainless steel coated with zirconium nitride. 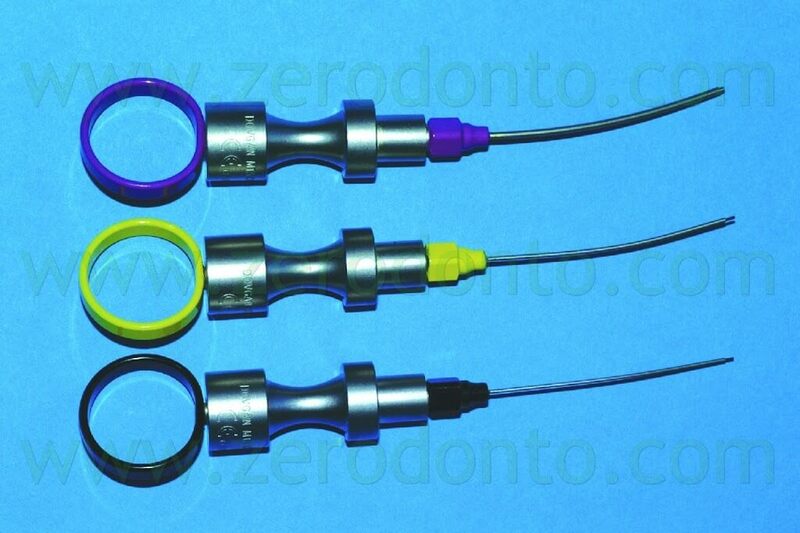 They are called KiS Microsurgical Ultrasonic Instruments (Obtura Spartan) and ProUltra (Dentsply, Tulsa Dental) (Fig. 27a). c) they are slightly longer than other retrotips, for better access to areas difficult to reach. Retrotips coated with diamond are also available, like the ones designed by Elio Berutti (Fig. 28). Very useful are also the retrotips designed by Bertrand Khayat BK3, with three bends specifically made to reach areas of difficult approach (Fig. 29). 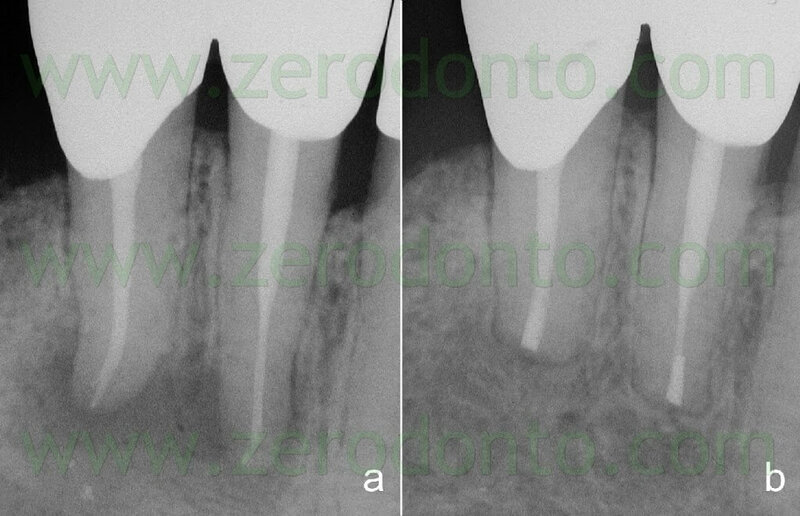 The retrotips should be placed perpendicular to the root surface and parallel to the long axis (Fig. 30) and then activated. The tips should penetrate the old filling material without resistance. 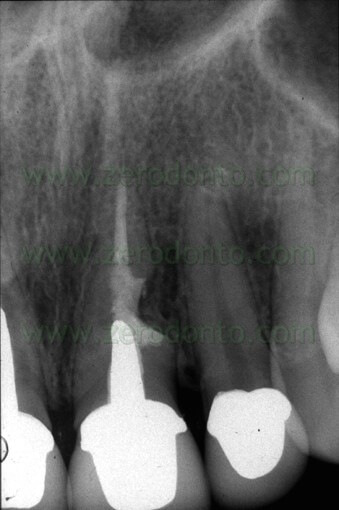 They should be activated only when inside the root canal and then deactivated before their removal from the root canal. This is done to avoid a scratch or any kind of damage to the surface of the root bevel. 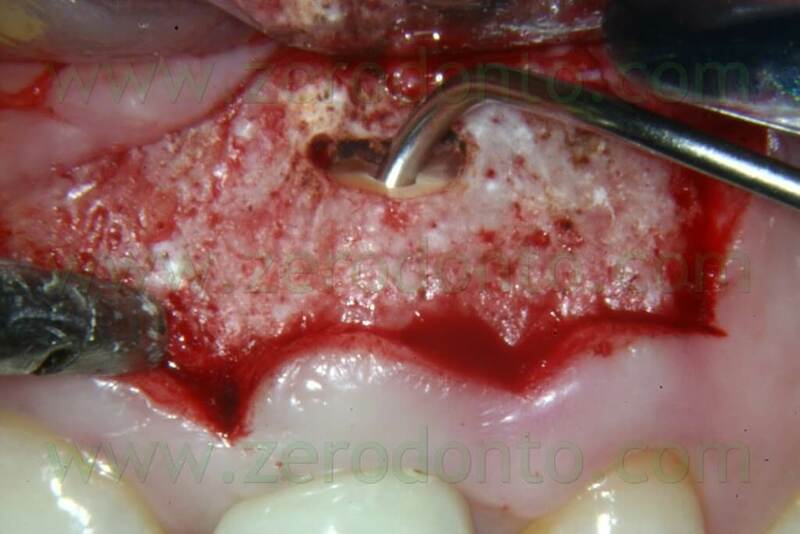 The removal of the previous failing amalgam retrofill is also facilitated by the use of the retrotips which many times can remove the old filling in one single piece, without risk of tatoo. 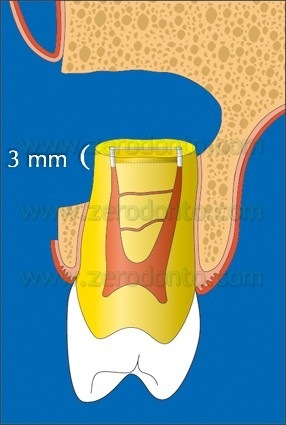 If the root to be treated has two or more canals, the surgeon must be very careful and look for the isthmus, which contains pulp tissue and debris as any other endodontic space and therefore must be cleaned and included into the retropreparation (Fig. 31). Failure to prepare and seal the isthmus is an invitation for failure (Fig. 32 a,b). The isthmus sometimes can be so narrow that it is difficult to see even under the microscope. Therefore, as a general rule, in all roots with multiple canals the isthmus must always be prepared,1 even though we cannot see it with the microscope! and the walls completely free of the old gutta-percha or sealer (Fig. 34). after the cavity has been irrigated with saline solution and dried with a light flow of air using the Stropko surgical irrigator15 (Fig. 36). 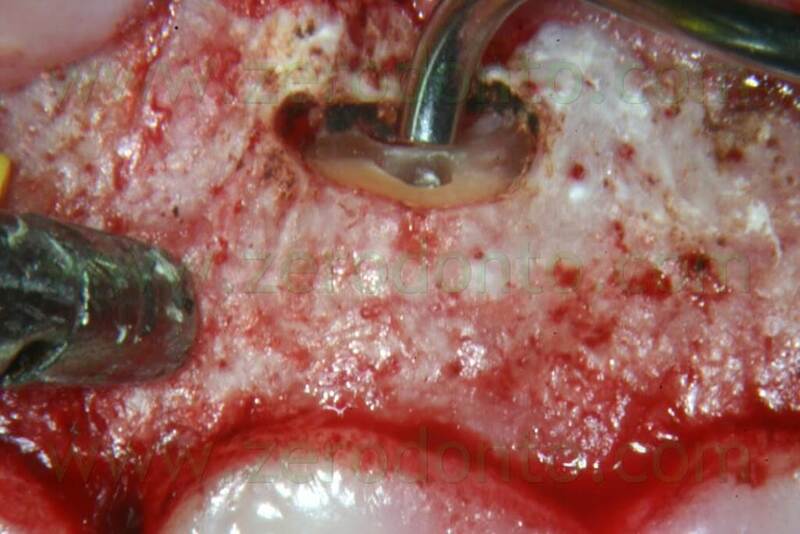 Historically, amalgam has been the retrofilling material of choice for many years, but today it is not used anymore since it has several disadvantages, like corrosion, expansion, and leakage. 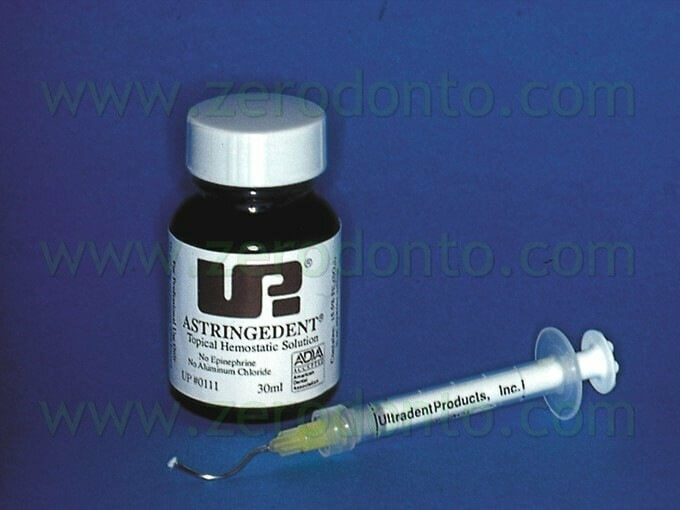 The most widely accepted retrofilling materials today are zinc oxide-eugenol cements, like IRM and Super EBA,8 and Mineral Trioxide Aggragate (ProRoot MTA Dentsply Tulsa Dental)).18 The zinc oxide-eugenol cements are easy to manipulate, have adequate working time, dimensionally stable, sufficiently biocompatible, bacteriostatic, radiopaque, don’t discolor the tooth or the surrounding tissues and are easy to remove. The Super EBA cement is mixed to a putty consistency, shaped into a narrow cone, attached to the end of a spoon excavator or a little spatula and carried to the apical preparation13 (Fig. 37). The cone of material reaches the base of the preparation while the sides of the cone contact the walls. Between each aliquot of material, a pre-fitted plugger is used to condense the Super EBA. The material is condensed in excess on the beveled surface of the root using a ball burnisher. When the cement has set, a finishing bur is used to finish the retrofilling. 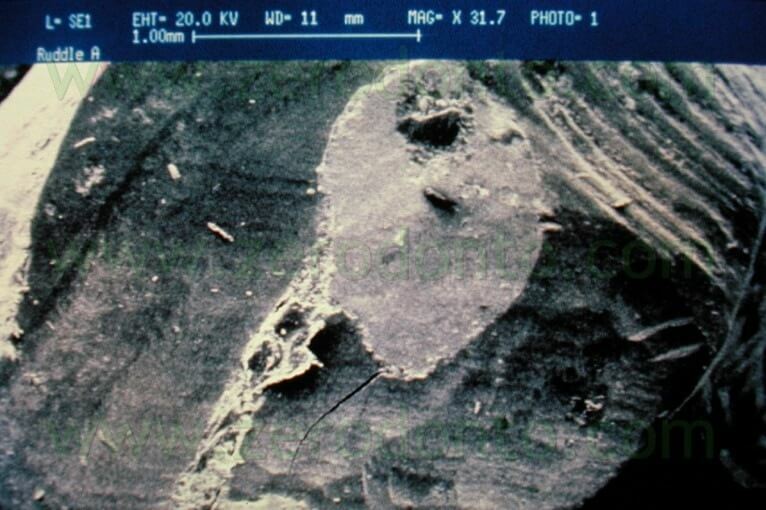 The integrity of Super EBA is then examined at high magnification after the surface has been dried with the Stropko irrigator. A post-operative radiograph is now exposed and then the surgeon is ready to suture the flap. 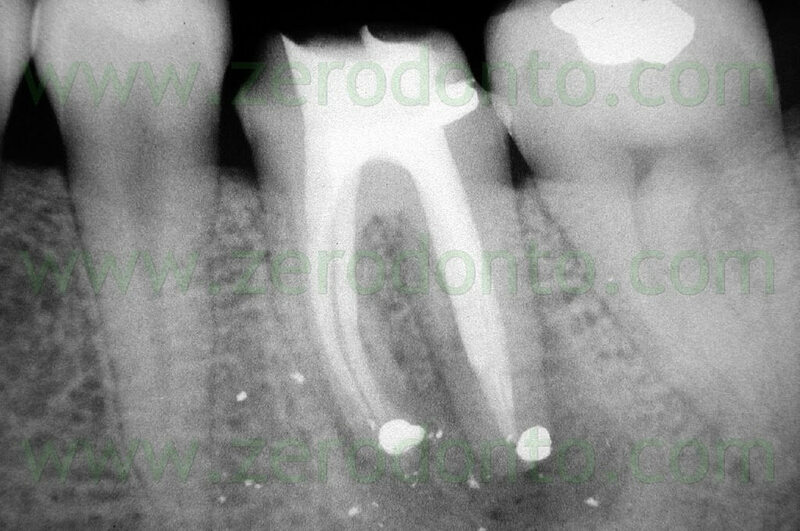 On the other hand, it is well known and universally accepted that isolation of the operative field for the moisture control is a challenge in dentistry in general and in endodontics in particular. In non-surgical endodontics, the root canal system must be absolutely dry in order to achieve a good apical seal and any contamination with blood must be avoided. 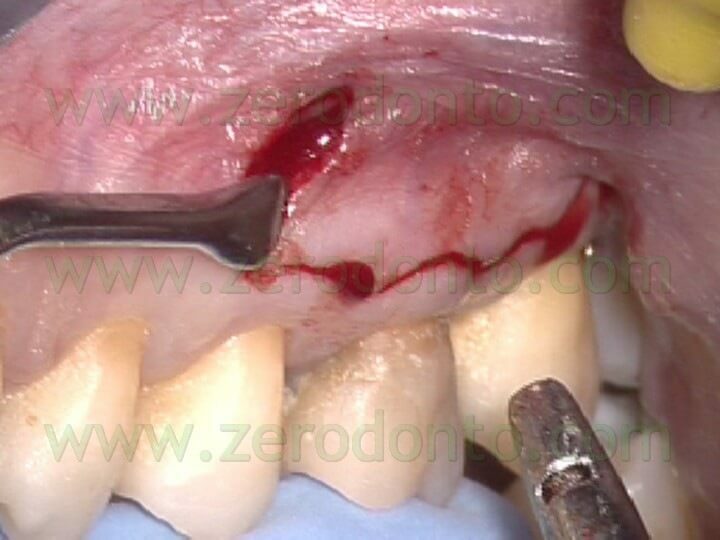 In the same way, during a direct pulp capping as well as during a perforation repair the hemorrhage must be kept under control, and of course also in surgical endodontics during the retrofilling the cavity must be completely dry. 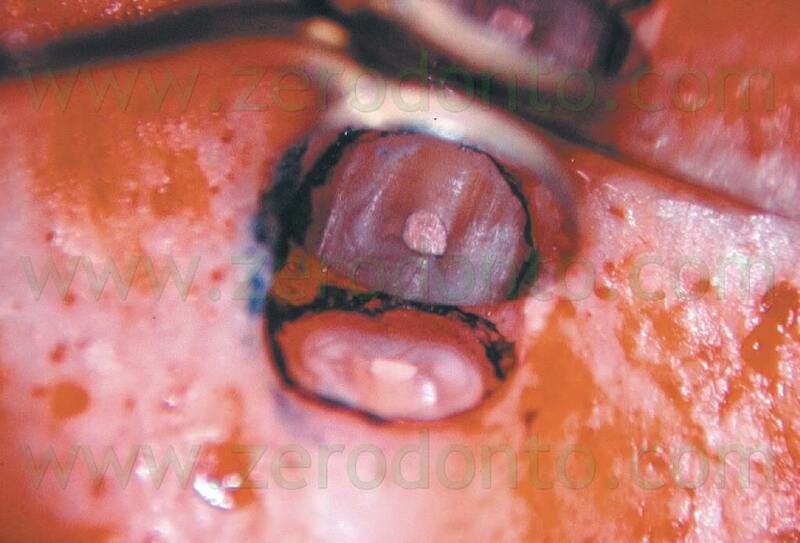 As an alternative to ZOE cements, a new material has been recently introduced in endodontic surgery as a retrofilling material14,16-18(Fig. 38). Mineral Trioxide Aggregate (MTA) is a powder consisting of fine hydrophilic particles of tricalcium silicate, tricalcium aluminate, tricalcium oxide and silicate oxide. It also contains small amounts of other mineral oxides, which modify its chemical and physical properties and make the material radiopaque. Hydration of the powder results in a colloidal gel that solidifies to a hard structure in approximately three hours. Materials used to seal the retro-preparation in surgical endodontics are inevitably in contact with blood and other tissue fluids. Moisture may be an important factor due to its potential effects on the physical properties and sealing ability of the restorative materials.16 As shown by Torabinejad et al,16 MTA is the only material that is not affected by moisture or blood contamination: the presence or absence or blood seems not to affect the sealing ability of the Mineral Trioxide Aggregate. In fact, MTA sets only in the presence of water.17 Having said that, the MTA is considered today the material of choice for direct pulp capping,17 to close open apices,17 to repair perforations 17 and to seal the retropreparations in Surgical Endodontics. f) activates cementogenesis (Figs. 39 a,b; 40 a,b,c). A disadvantage of the material is that it is not easy to handle and when it was first introduced to the market, there was no appropriate carrier to position it during different applications. 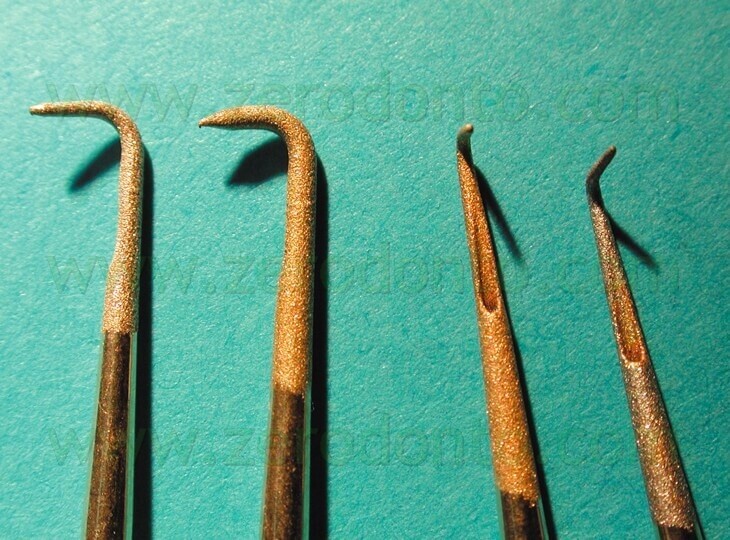 but even though the needles were bendable, its use was not comfortable during surgery. In the year 2000 another carrier was proposed by Edward Lee,7 but its use was limited to surgery (Figs. 42,43). 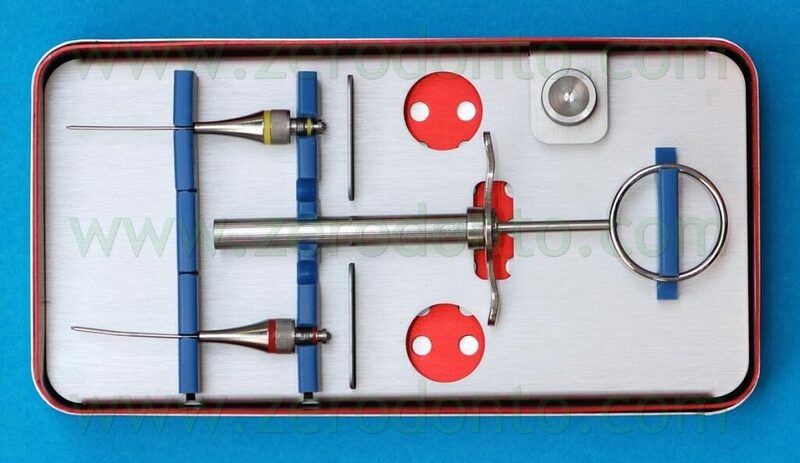 and this can be considered an “universal” carrier, since it has special needles that can be used both in clinical and in surgical endodontics and during surgery allows an easy positioning of MTA also in posterior teeth. developed in cooperation with Dr. Bernd Ilgenstein, and single angle (Fig. 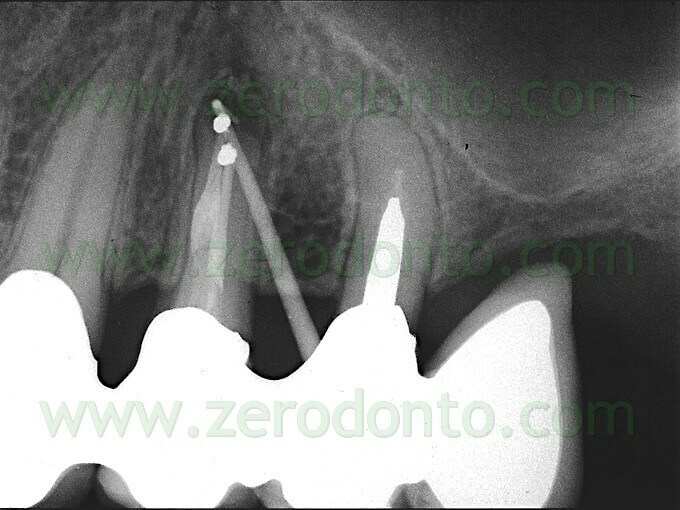 48) needles are best indicated for surgical endodontics. The surgical needles are available in two variants, right-angled and left-angled, each with two external diameters, 0,9 mm (yellow) and 1,1 mm (red). The internal diameter of the cannulas is 0,6 mm (yellow) and 0,8 mm (red), which allows for sufficient portions of the retro-filling material to be applied successively. The filling material can be taken from a dispenser/well (Fig. 49). and the plungers of the straight and curved needles are made of NiTi (Fig. 51). ). 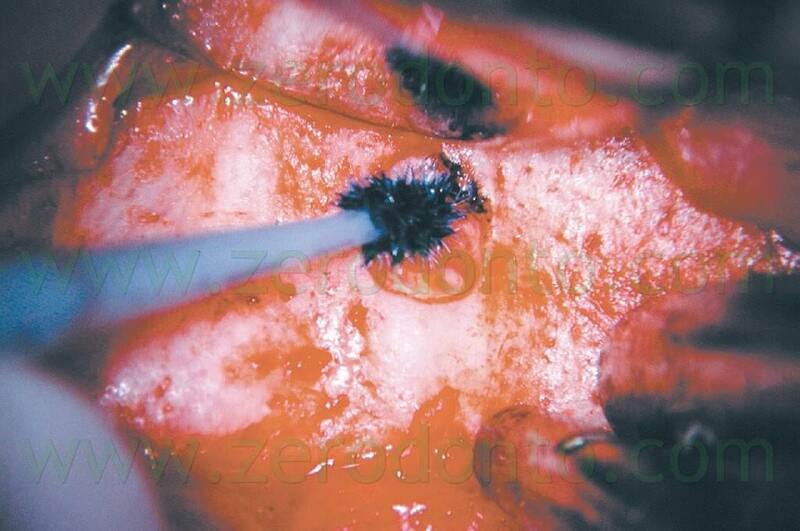 Residues of material in inside the cannulas can be easily removed with a cleaning curette (Fig. 52 a,b). It is well known that since the ultrasonic tips have been introduced into the market, the root surface is no more cut with a bevel at 45°, but rather with an almost 90° angle (Fig. 19b). This involves the need of a specific carrier in order to deliver the retro-filling material at a 90° angle (Fig. 53a-e). The MAP System is the perfect carrier for this purpose, having several needles in different sizes and with different angulations. The single angle needles are best indicated for anterior teeth while the triple angle needles are best indicated for posterior teeth. They are available in two variants, right-angled and left-angled, for an easier treatment of hard-to-reach regions (palatal canals of upper premolars and molars, lingual canals of lower molars). ), so that it will not only deliver the MTA in the retro-preparation, but will also act as a plugger and thus begin to compact the material in the deepest portion of the prepared cavity (Fig. 55 a-e). The risk of air bubbles can therefore be avoided. 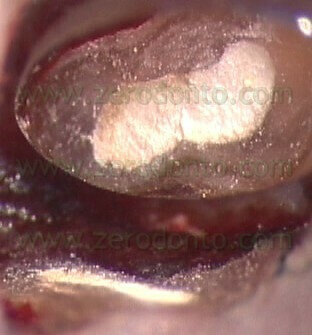 As a result, the retrograde root canal filling will always be well compacted. 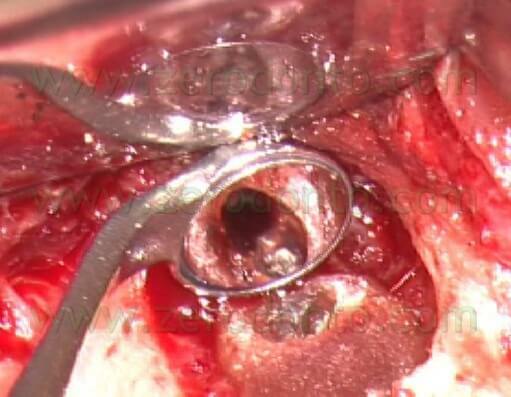 Another advantage of using the MAP System during surgery is the perfect control of the obturating material, which will be laid in the retro-cavity without any dispersion in the surrounding bone and soft tissue. Once the retro-cavity has been prepared using the ultrasonic retro-tips and the bleeding of the bony crypt is under control, the operator asks the dental assistant to mix the MTA to the correct consistency and then to handle the pre-fitted applicator syringe. The consistency of MTA must be neither too wet nor too dry. If the mix is too wet, it will be difficult to compact the material into the cavity properly. If it is too dry, it will be difficult to extrude the material from the needle and the syringe can remain blocked. Should the latter be the case, it is essential to avoid pushing too hard. The PEEK plunger is insufficiently rigid and will remain bent next to the bayonet catch, and thus needs to be replaced. For this reason, is always advisable to have two needles ready for use. Suturing under the operating microscope has the advantage of being more accurate in repositioning the flap, allowing a perfect healing by primary intention, without any scar tissue. 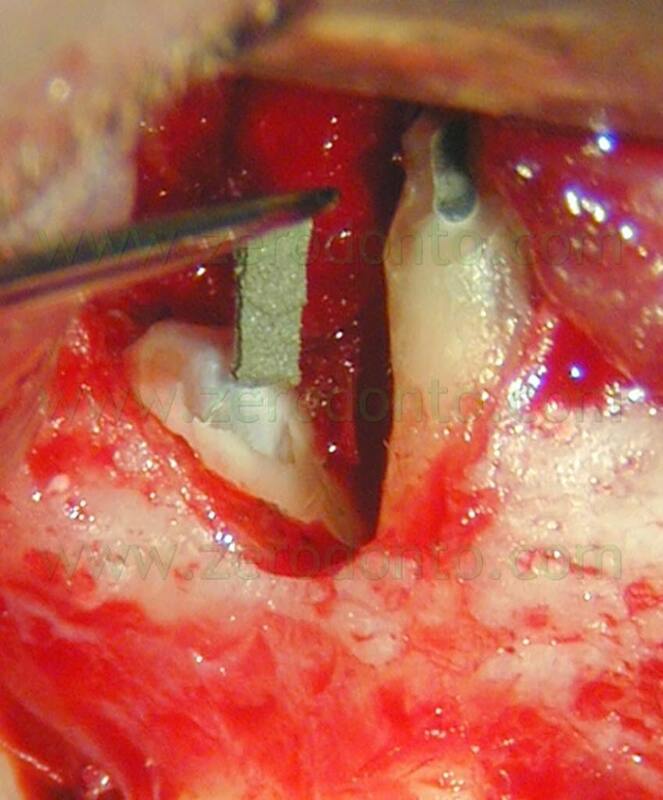 The author disagrees with people who recommend the use of the microscope for osteotomy, curettage, apicectomy, apical preparation, retrofilling and documentation but not for the incision as well as for suturing. Suturing under the microscope can be difficult sometimes, especially in posterior regions, but the accuracy in reapproximation provided by the microscope cannot be compared with that provided by the use of loops or, even worst, by naked eyes. Ideally, the suture must keep the soft tissue in place during the time of healing and should not encourage colonization of bacteria. If repositioning has been accurate as it should be, healing occurs by primary intention in 24-48 hours and this is the reason why suture removal is indicated after 24-48 hours.1 When left in place for a longer period of time, the suture has no function and is simply an irritant: soon it will be completely covered by bacteria and will cause inflammation and delayed healing by secondary intention. Many suture materials are commercially available today. Silk is not recommended anymore because it encourages colonization by bacteria. Nylon is colonized more slowly, but is too rigid and often patients complain because the suture is irritating the lip or the cheek. Tevdek is a newly introduced suture made of a polytetrafluoroethylene impregnated polyester material. It is very resistant to bacterial colonization and is nonirritating. The suggested size of the suture is 6-0 (Fig. 56; Fig. 57 a,b; Fig. 58). Endodontic surgery can today be performed with an accuracy and predictability of results that were not possible to reach 10 or 15 years ago. Magnification and illumination together with the new instruments and materials provide a higher success rate than ever before (Fig. 59). Using the microscope, the incision is more accurate, the elevation of the flap is less traumatizing for the soft tissues, the osteotomy and the apicectomy are more conservative. Using the ultrasonic tips the retro-preparation is more precise, coaxial with the root canal, the entire circumference is cleaner, the retro-fill is also more accurate, and the exact repositioning of the soft tissue guarantees a perfect healing without any scar. For all these reasons, the surgical procedure is more predictable and the success rate is very high. Fig. 1. 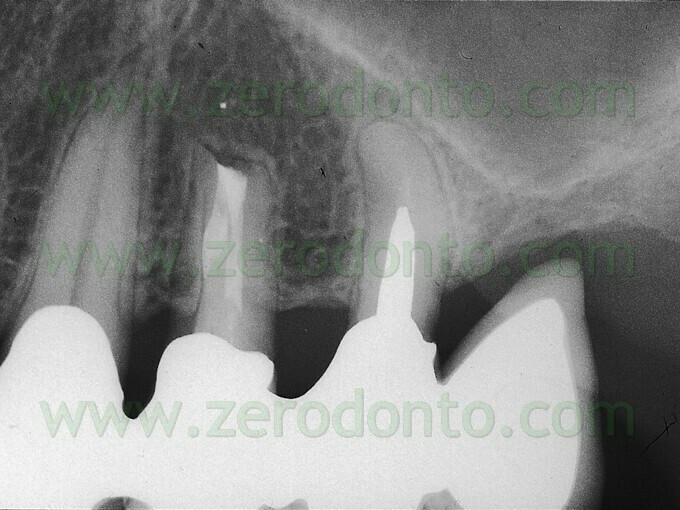 A typical example of Surgical Endodontics. A. Pre-operative radiograph. B. There are two sinus tracts present. 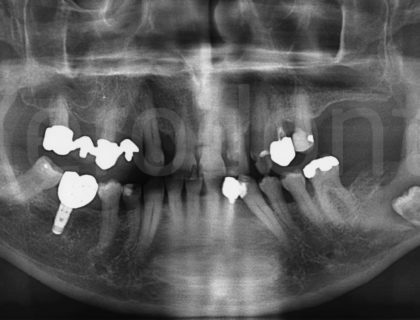 C. Post operative radiograph: the main and the lateral canals were retreated surgically. D. Two year recall. Fig. 2. 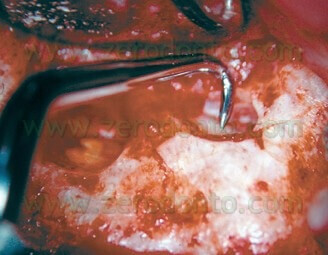 A typical example of Endodontic Surgery: the procedure was carried out after failure of a poorly executed orthograde therapy. A. Preoperative radiograph. B. Postoperative radiograph after orthograde retreatment. 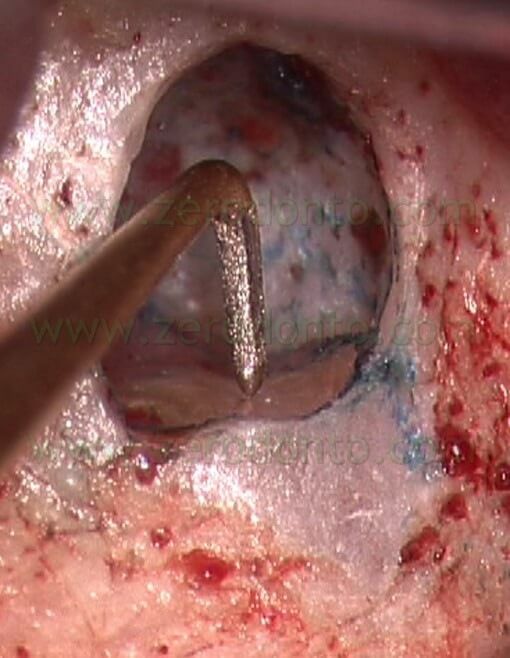 C. After a few months the patient presented with a fistula: now there is an indication for surgical retreatment. D. Postoperative radiographs : Super EBA was used as a retrofilling mate-rial. E. Two year recall. Fig. 3. A. 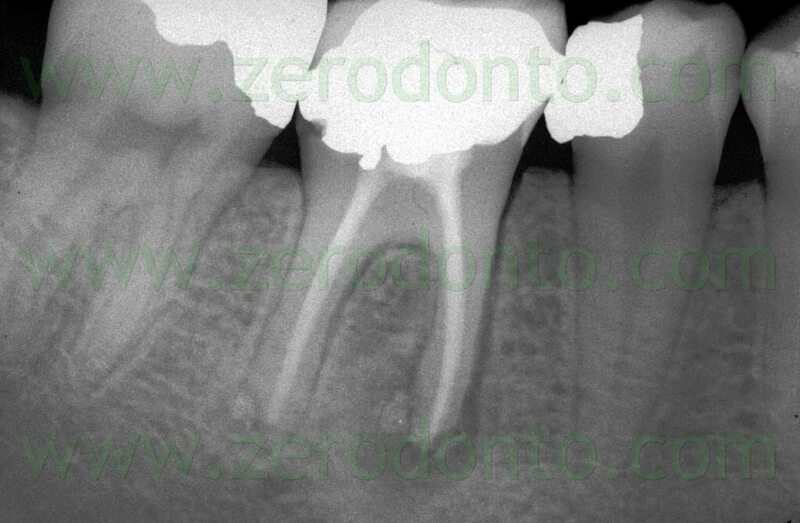 Due to presence of material beyond the apex and the closeness of the preceeding root canal obturation to the bifurcation, there could be an indication for surgical retreatment. 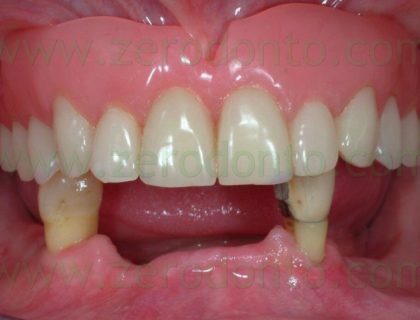 B. Orthograde retreatment was carried out which brought to light the presence of two missed canals, the distobuccal and the mesio-medial canal. C. The five year recall shows the complete healing of the lesion and complete disappearance of the extruded apical material, confirming that a “foreign body reaction” is an excuse invented by someone who advocates to stay short just because does not want to and does not know how to prepare canals in their entire length. Fig. 4. The smallest contra-angle handpiece is too big compared to the ultrasonic retro-tip. Fig. 5. SEM image of a retro-preparation made with a bur. 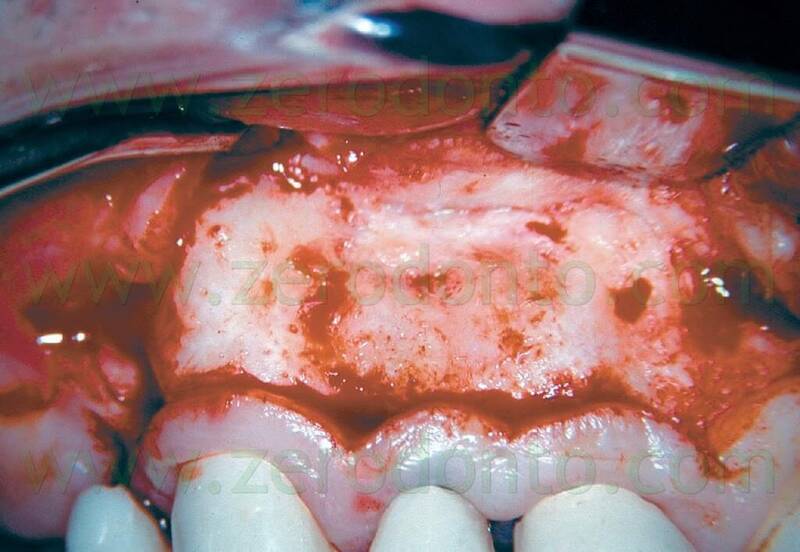 The cavità doesn’t include the buccal aspect of the original canal (Courtesy of Dr. Gary Carr, San Diego). Fig. 6. A. The original canal (up) and the retro-preparation (down) made at the expences of the palatal side of the original canal. B. The original canal. 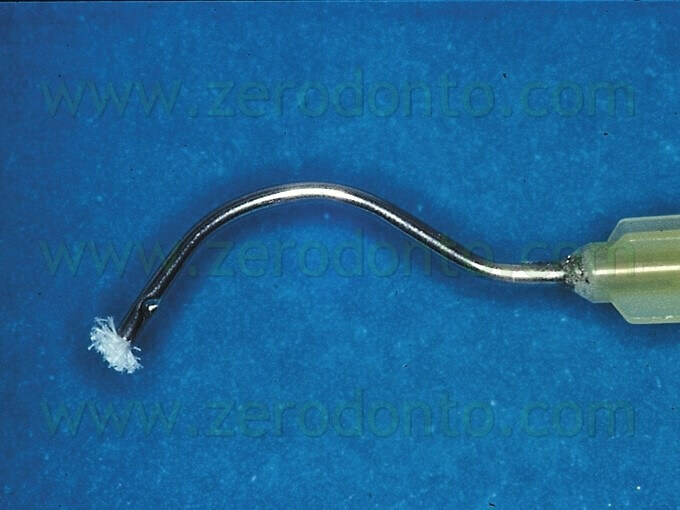 C. The cavity has been made with a round bur working in a palatal direction. been missed. C. The isthmus has been adequately prepared and sealed. D. Two year recall. Fig. 8. 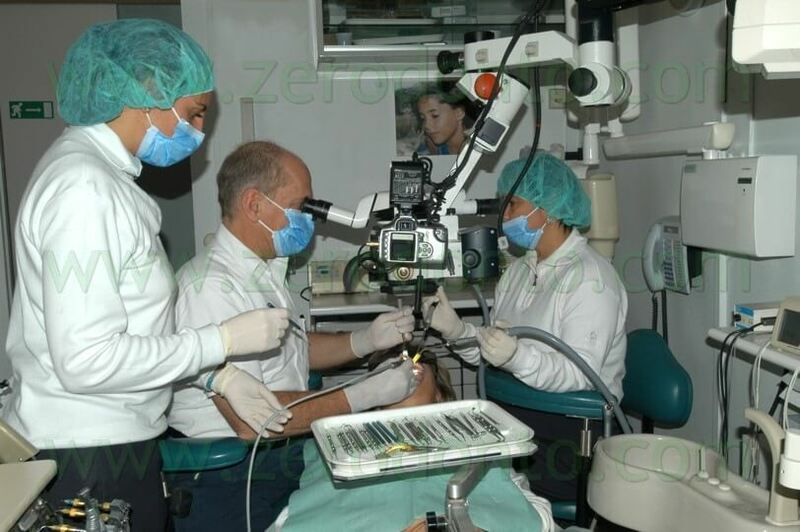 The surgical operating microscope allows a more ergonomia and comfortable working position. Fig. 9. Working at small magnification it is possibile to visualize the entire operative field. Fig. 10. During a surgical procedure in a lower quadrant it is necessary to localize the mental nerve to avoid any kind of damage to this important anatomical structure. 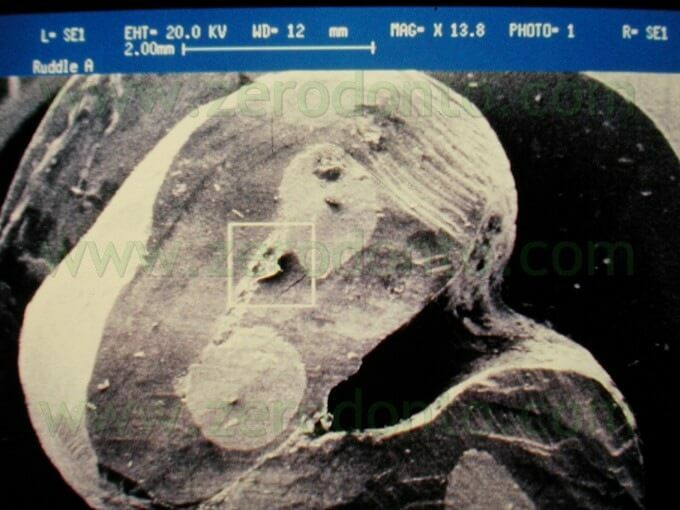 The photograph has been taken through the operating microscope at minimum magnification. Fig. 11. The bony crypt should be large enough to allow the introduction of the ultrasonic tips. Fig. 12. The use of anesthetic solution with vasoconstrictor 1:50.000 is the “conditio sine qua non” to perform the surgical procedure. Fig. 13. 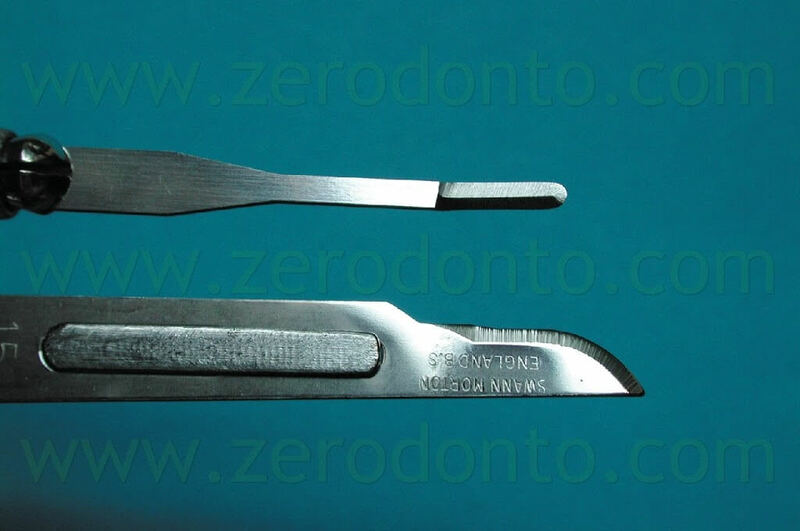 Comparison of BP #15C blade to a CK2 micro-surgical blade (CK Dental). Fig. 14. A-C. The microsurgical blade is making a sub-marginal flap, and is undermining flap elevation using Ruddle 30° curette in order not to damage the periostium. Fig. 15. The sub-marginal flap should be made using the blade at 90° to the underlying tissue. Fig. 16. 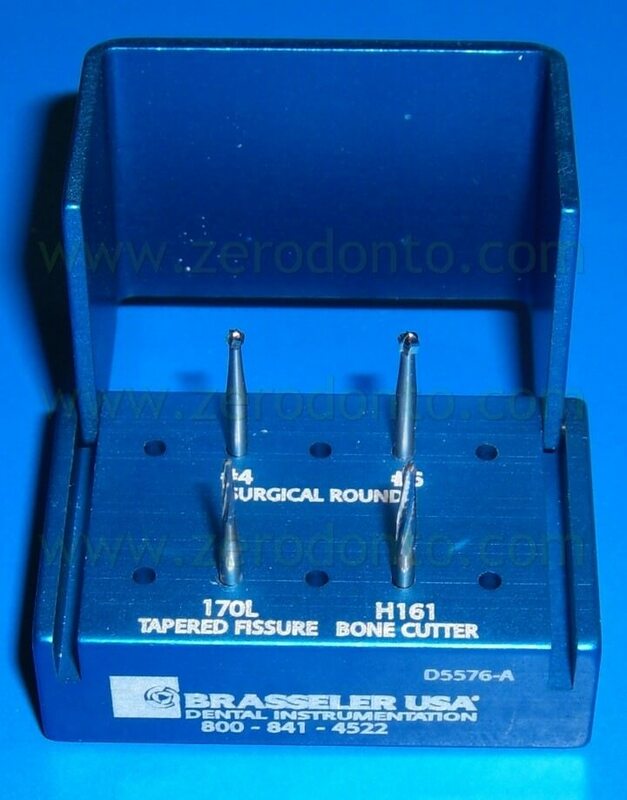 Surgical round burs for high speed (up) and fissure burs (bottom). Fig. 17. 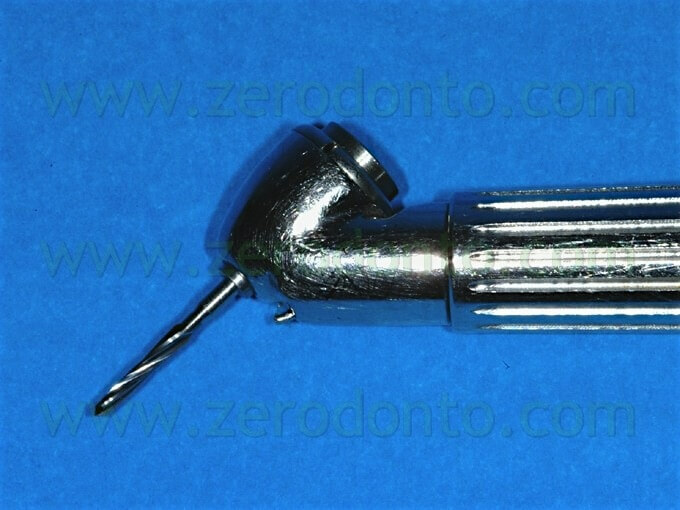 Lindemann bone cutting bur,mounted on the Impact Air 45 surgical handpiece. Fig. 18. 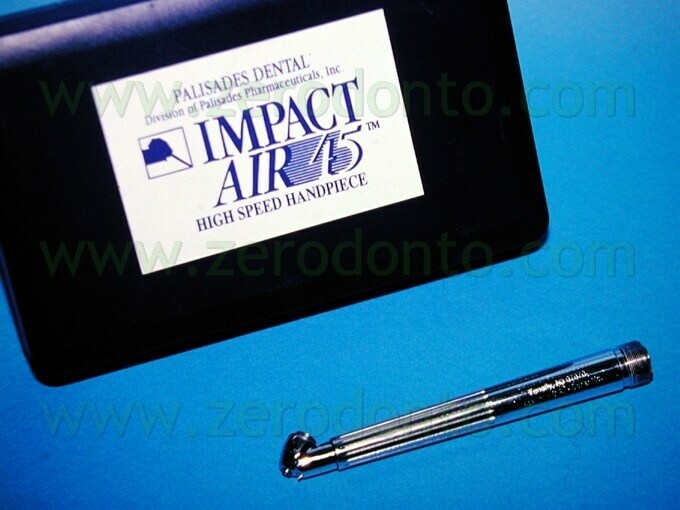 The surgical handpiece Impact Air 45 (Star Dental, Lancaster, PA, USA) enhances efficiency, safety and vision and prevents the risk of air embolism. Fig. 19. A, B. The root is sectioned almost with a 90° angle. Fig. 20. 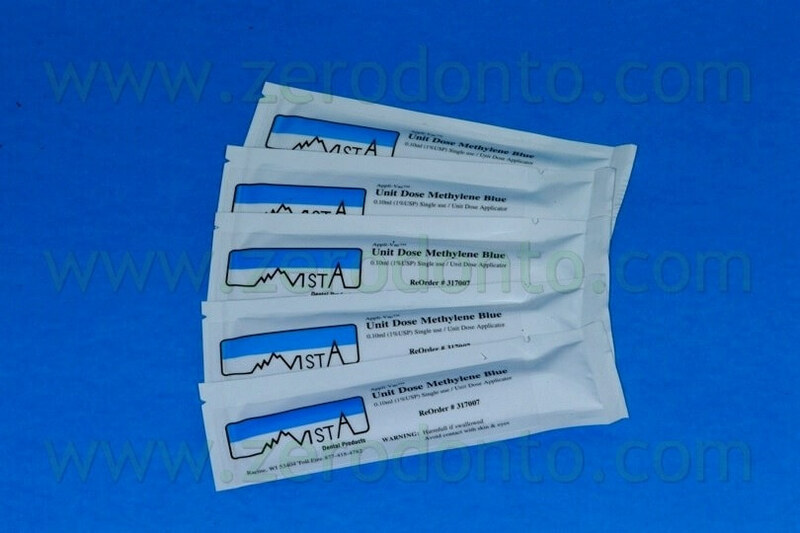 The methylene blue (Vista Dental, Racine, WI, USA) is used to visualize an apical vertical root fracture. Fig. 21. A-C. 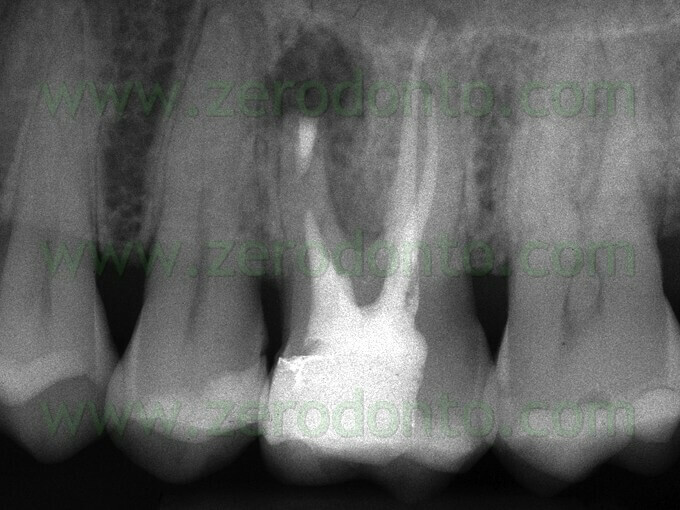 The apical vertical root fracture is now evident. Fig. 22. Same case of fig. 21. A. Pre-operative radiograph. 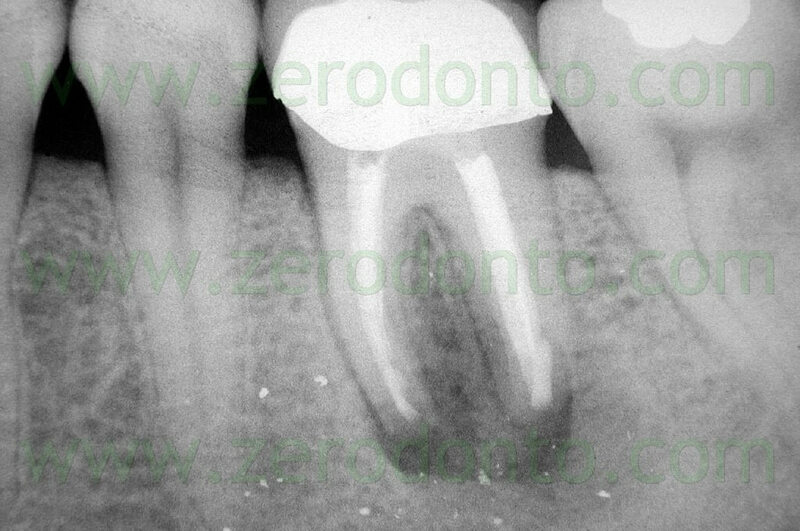 The upper right first premolar has a separated instrument in the palatal root and an overfilling of gutta-percha next to the buccal root. 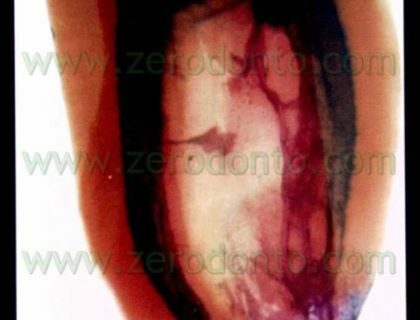 During the surgical procedure it was evident that the extrusion of gutta-percha happened through the apical vertical root fracture that was caused by the lateral condensation technique. B. Post-operative radiograph. C. Two year recall. 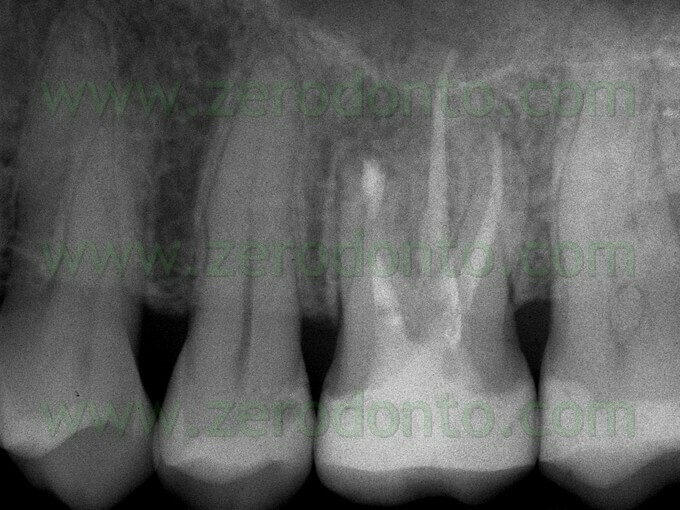 If the apical root fracture can be eliminated during the beveling of the root structure, the prognosis remains excellent. Fig. 23. A. The ferric sulfate is used to control the bleeding in the bony crypt. B. The needle has a little brush, to gently paint the bony crypt with the solution. Fig. 24. Carr Tips angled at 90° (CT1, CT5) and 70° (back action). Fig. 25. Carr Tips “Slim Jim” #1 and #5. Fig. 26. 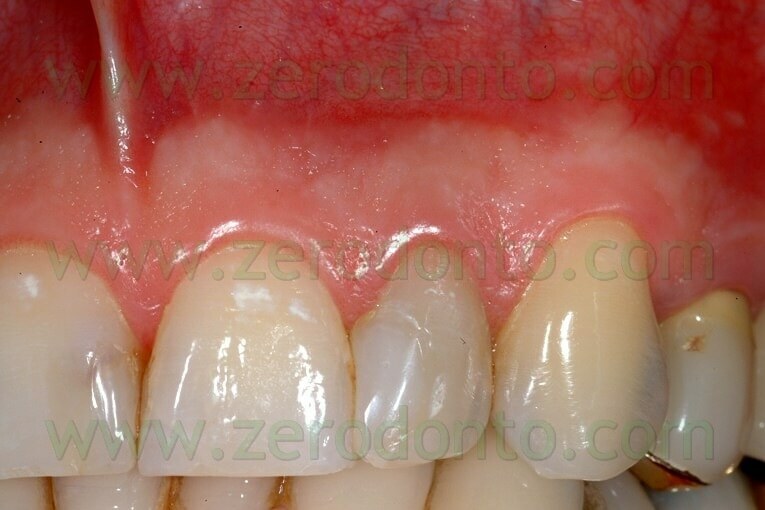 The Back Action tip is indicated in roots with a very pronounced lingual inclination, like the upper lateral incisor. Fig. 27. A. 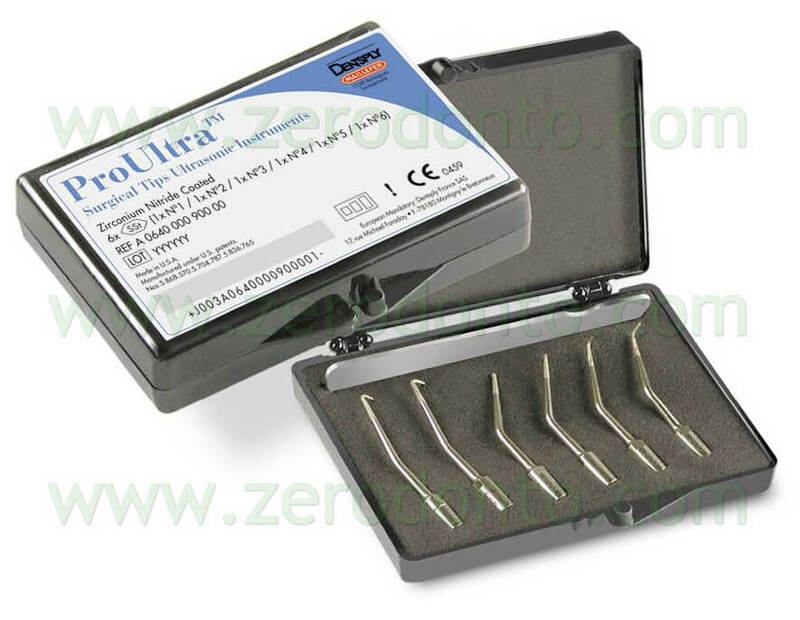 The ProUltra Microsurgical Ultrasonic Tips designed by Clifford Ruddle. B. Note the irrigation port very close to the working tip. Fig. 28. 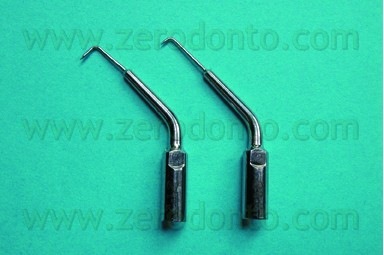 The retrotips designed by Elio Berutti are diamond coated (EMS). Fig. 29. The retrotips BK3 designed by Bertrand Khayat (Satelec) have three bends specifically made to work easily in posterior teeth. Fig. 30. The ultrasonic tip should be positioned first and then should be activated. Fig. 31. 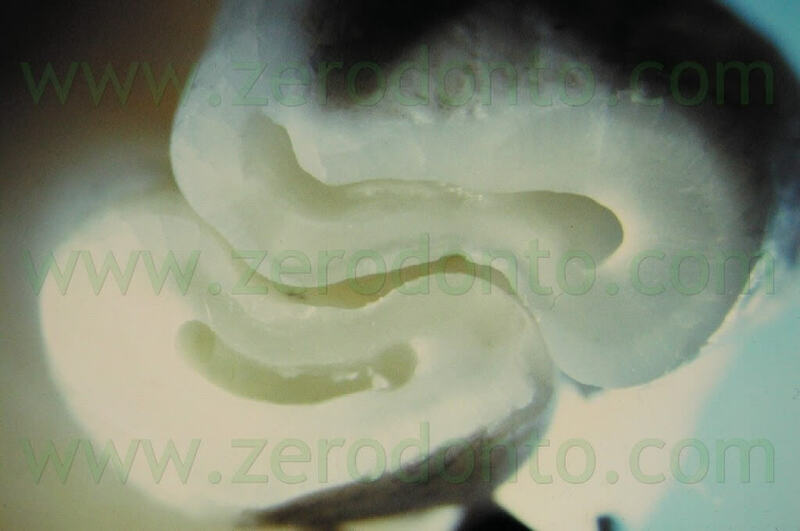 Stereo-microscopic view of the retropreparation made in an extracted third molar: the isthmus has been incorporated into the retropreparation, with the maximum respect of the root canal anatomy. Fig. 32. A. This retrofil failed because the isthmus was missed. 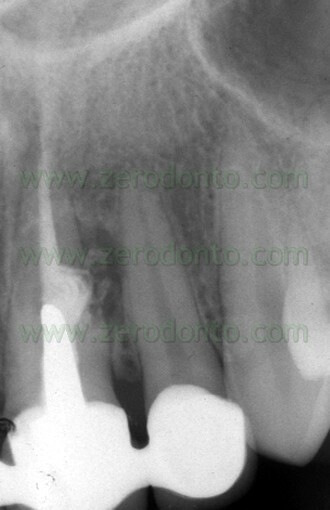 Note also how the two amalgam retrofils have almost nothing to do with the original location of the two root canals. B. Same tooth at higher magnifications (Courtesy of Dr. Gary Carr, San Diego). Fig. 33. 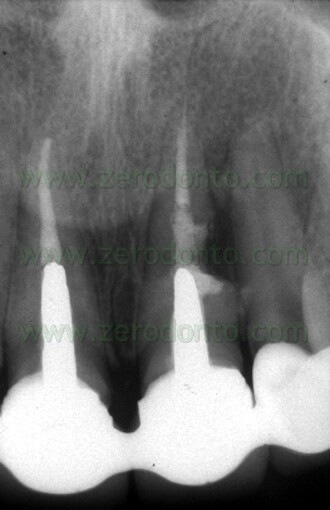 The ultrasonic root end preparation must be at least 3mm deep and within the long axis of the root canal. Fig. 34. 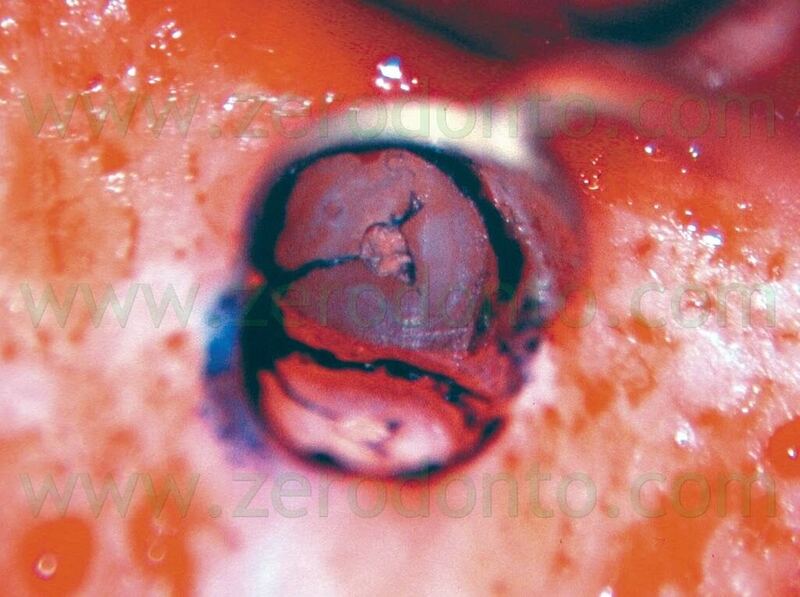 The ultrasonic root-end preparation of the mesio-buccal root of an upper molar. The preparation has included the two canals and the isthmus. Fig. 35. EIE miniature retromirrors. The more often used are the oval (3×6 mm) and the round (3 mm) (Courtesy of Dr. Gary Carr, San Diego). Fig. 36. Utilizing the Stropko irrigator, a precise, controlled stream of air can be directed into the root-end preparation and effectively enhance vision and dry the cavity. Fig. 37. The tapered end of the SuperEBA roll is attached to the end of a little spatola and is being positioned inside the retroprep. Fig. 38. 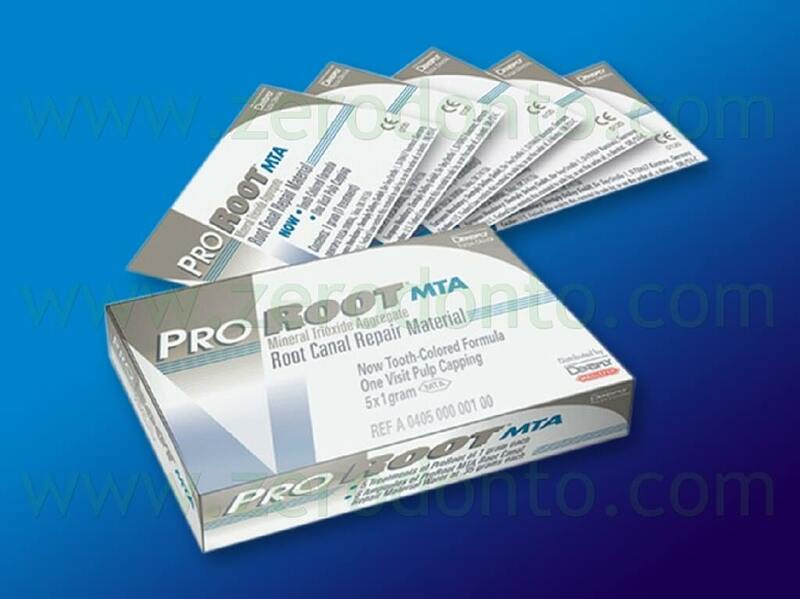 The white ProRoot MTA (Dentsply Tulsa Dental, OK). Fig. 39. A. Post-operative radiograph. The retrofil has been made using white MTA. B. Two year recall. Note the perfect healing. Fig. 40. A. Pre-operative radiograph. B. Post-operative radiograph. The retrofil has been made using grey MTA. C. Two year recall. Note the perfect healing. Fig. 41. 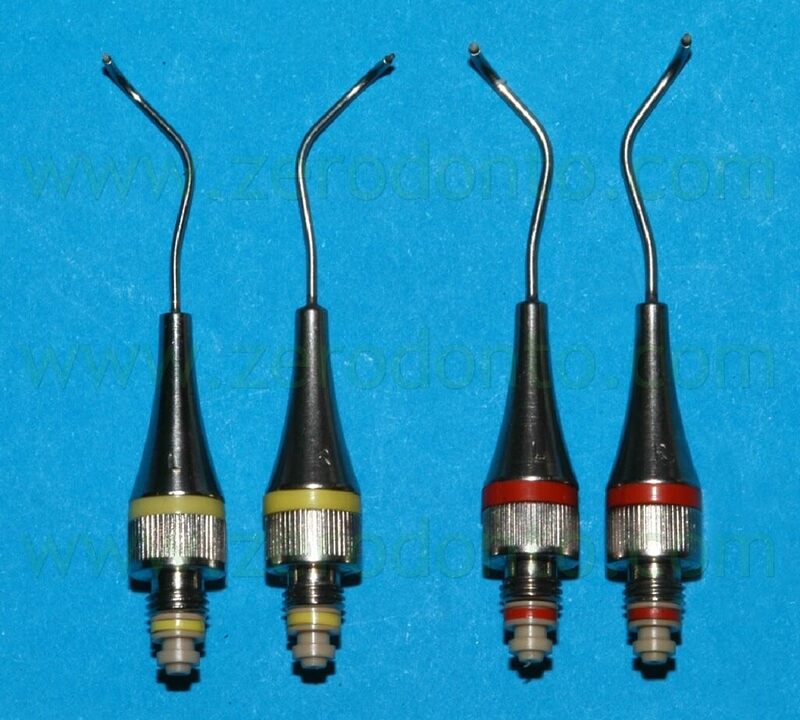 Dovgan carriera (Quality Aspirators). Fig. 42. The carrier described by Dr. Edward Lee. Fig. 43. The pre-measured aliquot of MTA is easily delivered into the root-end preparation (Courtesy of John Stropko, Phoenix, AZ). Fig. 44. 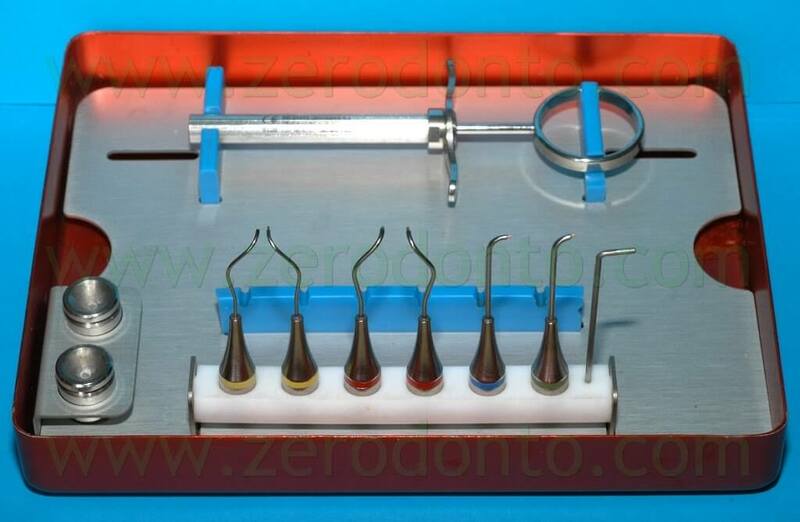 The Micro Apical Placement (MAP) System (Produits Dentaires SA, Switzerland). Fig. 45. The bayonet catch for connecting the exchangeable needles. Fig. 46. 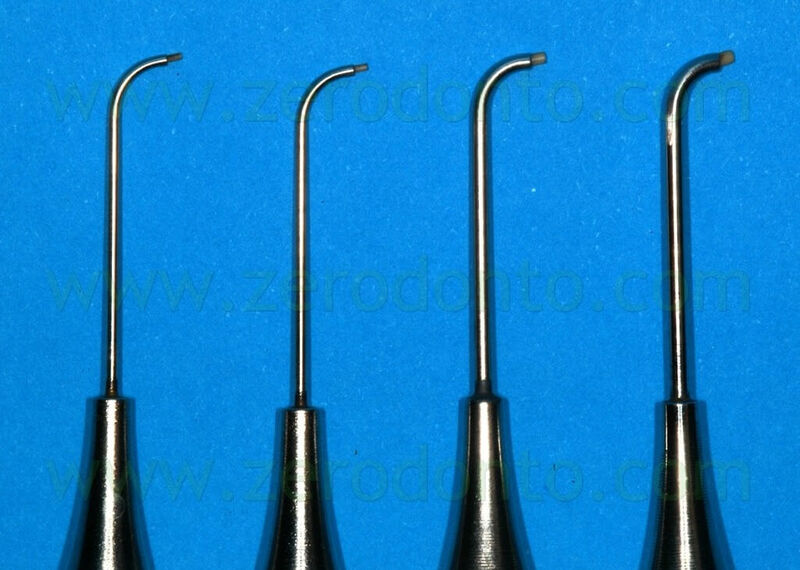 The straight needles for nonsurgical endodontics. Fig. 47. 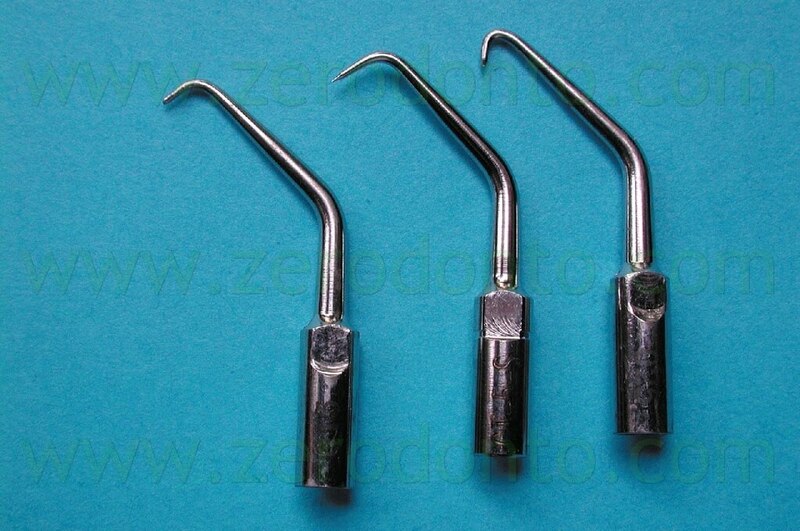 The triple-angle needle for surgical endodontics in posterior teeth. Fig. 48. 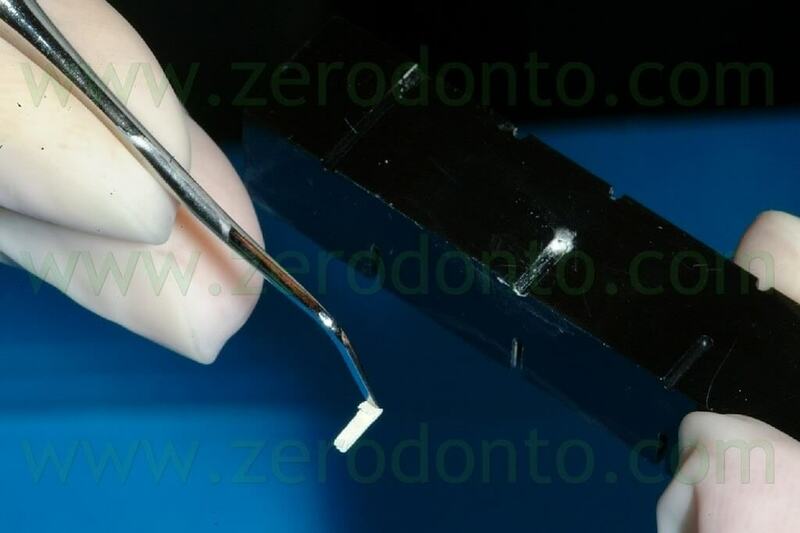 The single-angle needle for surgical endodontics in anterior teeth. Fig. 49. Dispenser for filling material. Fig. 50. The intra-cannular plunger of the angled needles is made of PEEK. Fig. 51. The intra-cannular plunger of the straight needles is made of NiTi. Fig. 52. A. Cleaning curettes of different sizes. B. The tip at higher magnification. Fig. 53. A-E. The pre-fitted needle is carrying the filling material. Fig. 54. The intra-cannular plunger inside the needle is intentionally longer than the needle itself. Fig. 55. A-E. The carrier also functions as a plugger, beginning to compact the filling material in the deepest portions of the prepared cavity. 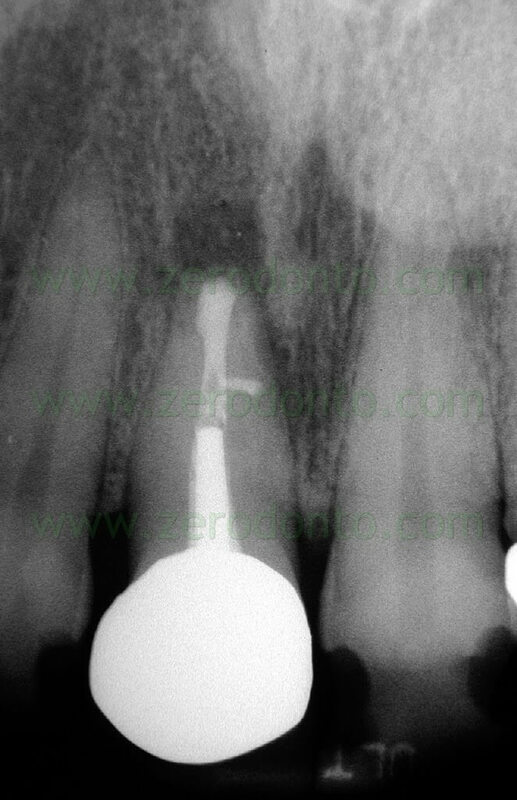 F. Pre-operative radiograph. G. Post-operative radiograph. H. Two-year recall. Fig. 56. 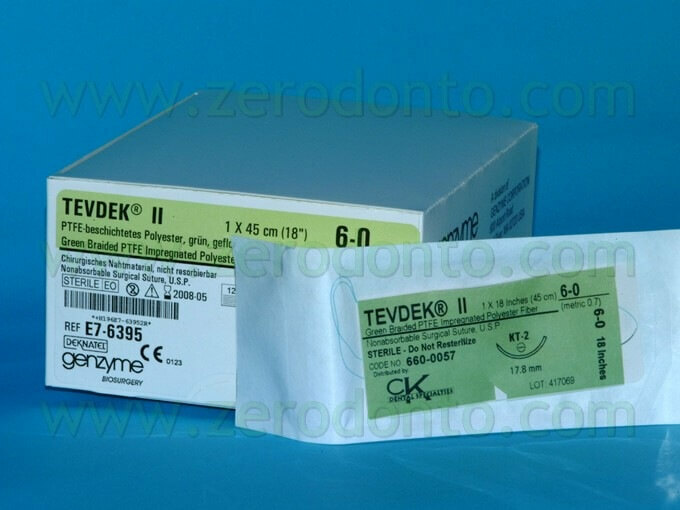 Tevdek 6-0 polyester suture (CK Dental Specialties). Fig. 57. A. The Luebke-Ochsenbein flap has been sutured with 6-0 Tevdek. B. Three year recall: complete absence of scarring. Fig. 58. In this other case, the patient could not come back for suture removal before the fifth day afterv surgery was completed. 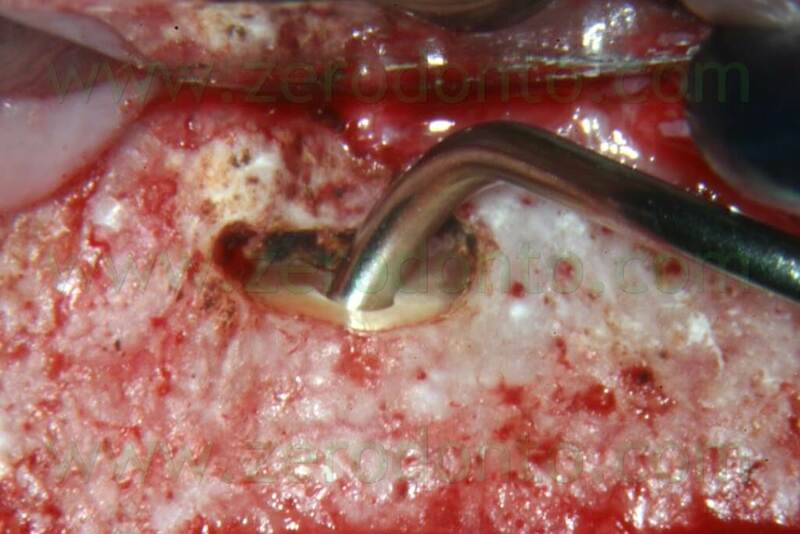 Note the complete absence of plaque around the Tevdek suture. Fig. 59. A. Pre-operative radiograph. B. Two year recall. 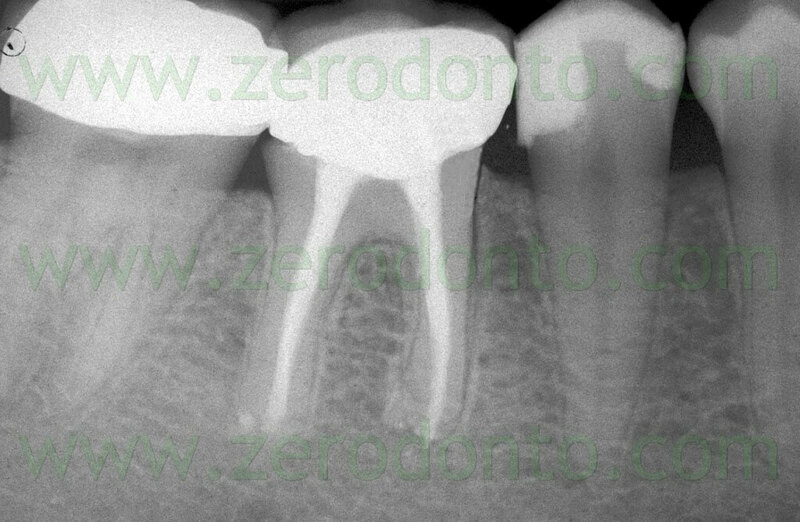 Note the retrofil three mm deep, within the long axis of the root canal, and of the same size like the original root canal. Dr. Castellucci graduated in Medicine at the University of Florence in 1973 and he specialized in Dentistry at the same University in 1977. From 1978 to 1980 he attended the Continuing Education Courses on Endodontics at Boston University School of Graduate Dentistry and in 1980 he spent four months in the Endodontic Department of Prof. Herbert Schilder. Since then, he has a limited practice on Endodontics. 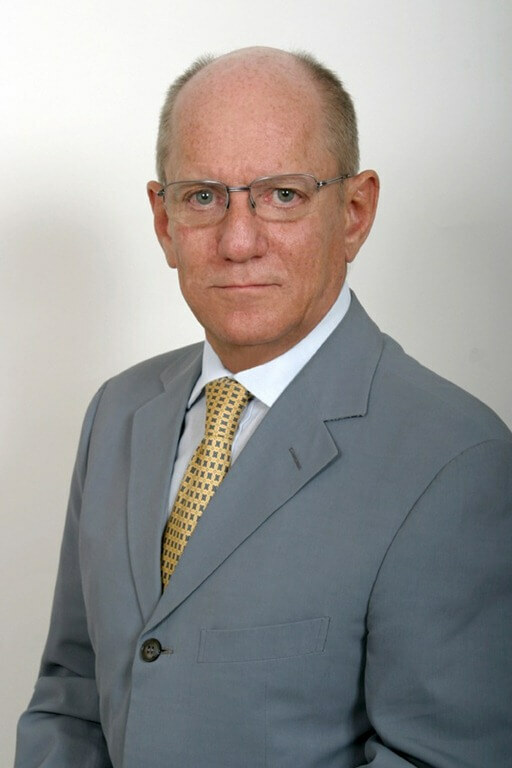 He is Past President of the Italian Endodontic Society S.I.E., Active Member of the European Society of Endodontology E.S.E., Active Member of the American Association of Endodontists A.A.E., Active Member of the Italian Society of Restorative Dentistry S.I.D.O.C. He has been the President of the International Federation of Endodontic Associations I.F.E.A. in 1990-92. 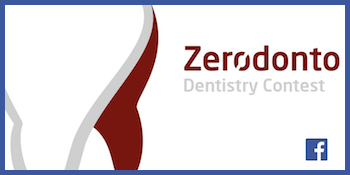 From 1983 to 2000 he has been Professor of Endodontics at the University of Siena Dental School. Now is Visiting Professor of Endodontics at the University of Florence Dental School.In the year 2009 has bee nominated Honorary Professor of the State Higher Educational Estabilishment of Ukraina “Ukrainian Medical Dental Academy”. He translated into Italian the text on “Clinical and Surgical Endodontics. Concepts in Practice”, by Frank, Glick, Simon and Abou-Rass. 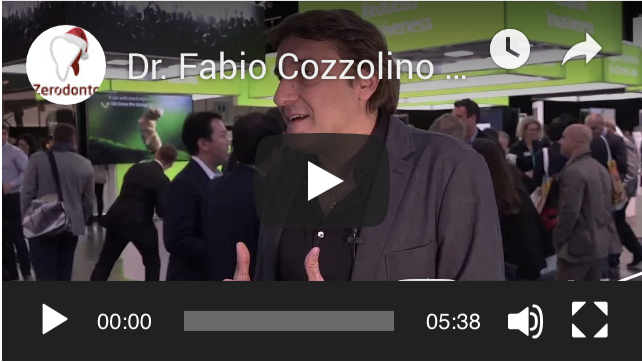 He is the Editor of “The Italian Endodontic Journal” and of “The Endodontic Informer”. He is also the Founder and President of the “Warm Gutta-Percha Study Club”. He published articles on Endodontics in the most prestigious Endodontic Journals. He is the author of the text “Endodonzia”, which now is available in the English language. 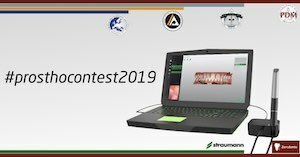 International lecturer, he is also Founder and President of the Micro-Endodontic Training Center in Florence, where he teaches and gives hands-on courses on the use of the Microscope in nonsurgical and surgical Endodontics in both languages, Italian and English.